March | 2018 | H.A.W.K.S. Chris Palmer This past weekend we got together for the third game in our Ghost Archipelago campaign. 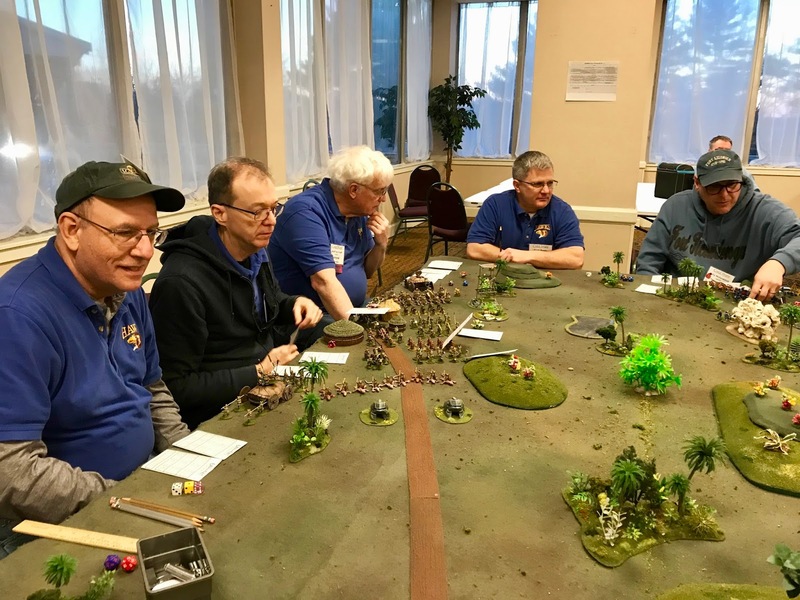 We had 5 of our regulars players and one guest player. We continued to work on the scenarios in the rulebook moving on to the second one: The Drichean Cages. 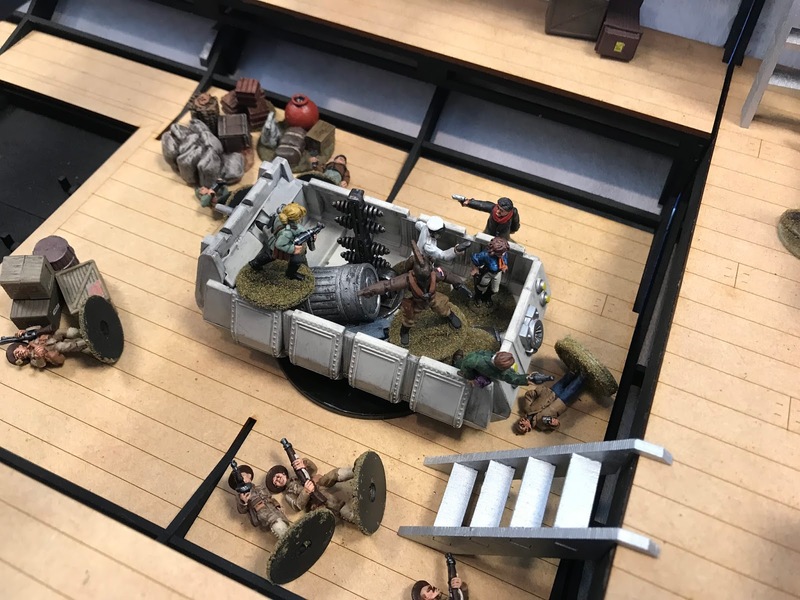 We used an 8’x3’ table and had three cages with their prisoners spaced evenly down the centerline of the table. Our job was to free the prisoners, and exit with them, or at least have possession of them at game’s end. 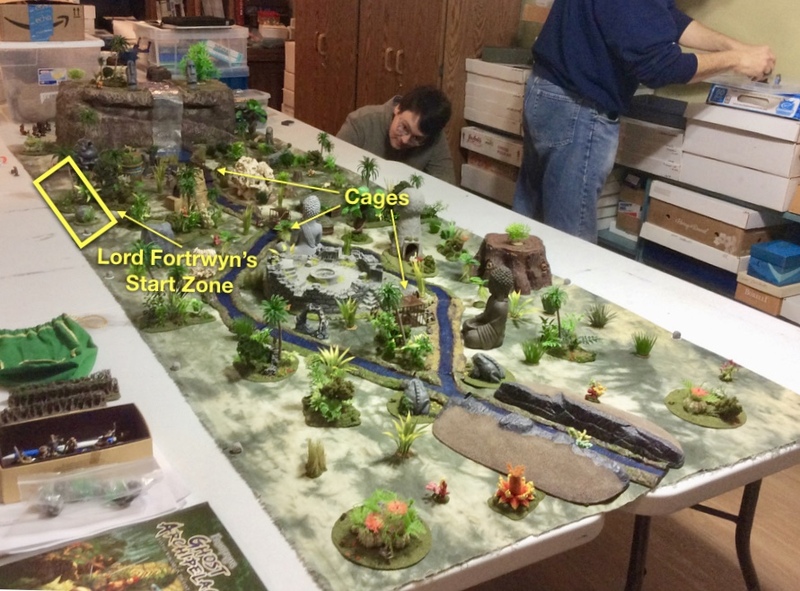 An overview of the table with the prisoners and my starting area marked. I was lucky with my chip draw for starting location, getting second choice. I picked one of the corners, down by the waterfall, as there seemed to be a good chance at getting at least a couple treasures there; including one that was easily within a single move away. The Heritor Gregorious and his Storm Warden, Missy, were directly across from me…it seemed the rematch that my Heritor and Gregorious knew would come one day after our first game, had arrived this day. To my right was a new Heritor, Kragmar of the True Blood, and his Storm Warden, Samael Gale. Diagonally across to my front right was the Heritor Herndon and his Storm Warden, Arwhine. To see my report from our previous game, see: The Xs Mark the Spots. One of the prisoners awaits his gruesome fate. Lord Fortrywn was a retired general, and the Elf Heritor was used to seeing dead bodies, and had already seen a fair share here in the Archipelago; but the one lying in the grass before him held special interest, for he recognized the man. It was the Heritor known as Tavic. The Elf would not shed a tear today for one who shared the blood gift, for the man was a known brute and lacked any civility. But Fortrywn did know one good thing about the man; he had amassed quite an enormous amount of treasure very quickly here in the Archipelago, something the deceased Heritor had never been shy to brag about. And everyone knew the crafty Human Heritor had hid it somewhere to keep it safe. Just then, Lord Fortrywn’s Hunter, Gwynwater Lighteye, came up and stood at attention before her old commander waiting to report. The Heritor lifted his head from looking at body at his feet and simply raised an eyebrow at the tall Elf-woman. Gwyn held open her palm, revealing a pair of bronze arrowheads on the ends of broken shafts, and stated, “It’s Dricheans, sir. 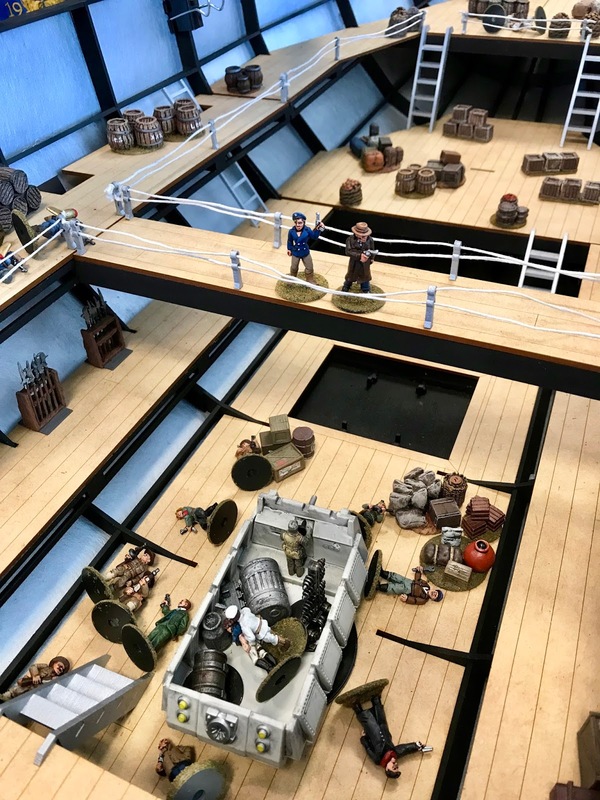 There’s the bodies of three of his crew15 yards over there,” she tilted her head, “and more of these,” she indicated the hand with the arrowheads. “And a shattered bronze blade." Lord Fortrywn picked up one of the metal points and considered it, his mind working on an idea. He set the arrowhead back in Gwyn’s hand, and thought out loud, "If there are only three dead, then some of his crew may have survived; and these survivors may know where old Tavic’s treasure is hidden." He stared out into the jungle. "You’ve heard of Tavic’s Treasure, or course." he directed his attention at Gwyn. 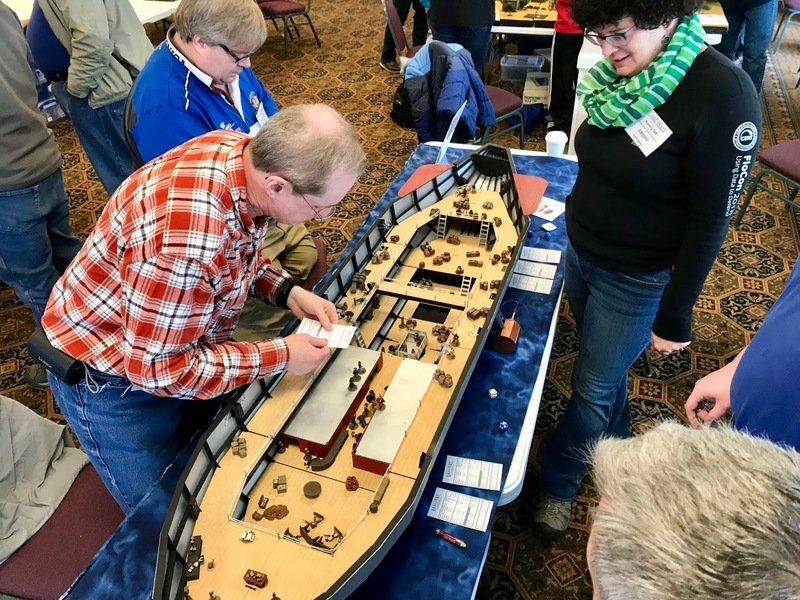 "If you can pick up a trail, and we could locate the remaining crew, they might be very grateful to whoever rescued them from the hands of these islanders." The Hunter smiled, and dropped the arrowheads into the tall grass. Turning, she strode away on her long legs to find the way. Lord Fortrywn’s disposition upon entering the battle area. Two hours later, Gwynwater put up her hand to indicate the group should stop. Lord Fortrywn came up to her, and silently the Hunter pointed to her own ear, and then pointed ahead. The Heritor tilted his head, listening, but all he heard was the sound of rushing water; as if a large churning river was ahead. He strained with his Elven ears to hear past the sound of the water. And then suddenly he picked it up faintly…voices in the distance. Gwyn held up 4 fingers. They advanced slowly, through the vegetation, until they both could see movement, and the glint of the sun on bronze armor. The voices and the roar of water were much louder now. Also, a large cliff face rising on their left had come into view, and from it a huge waterfall plummeted from the top into a wide pool below. Lord Fortrwyn divided his party into three groups. With him he took Gwyn, and the two seasoned crew-women, Arbyn and Bry. He ordered Randilas the Archer, Salin the Pearl Diver, and the crew-woman, Meriwyn (who was making her first trip with the ashore party) to go with his Warden, and niece, Marnilyne. Lastly, he had the two crewman Dirkand, and Lurlin wait in reserve to help where needed. Only a few yards further, and they came to a large frog-like idol. 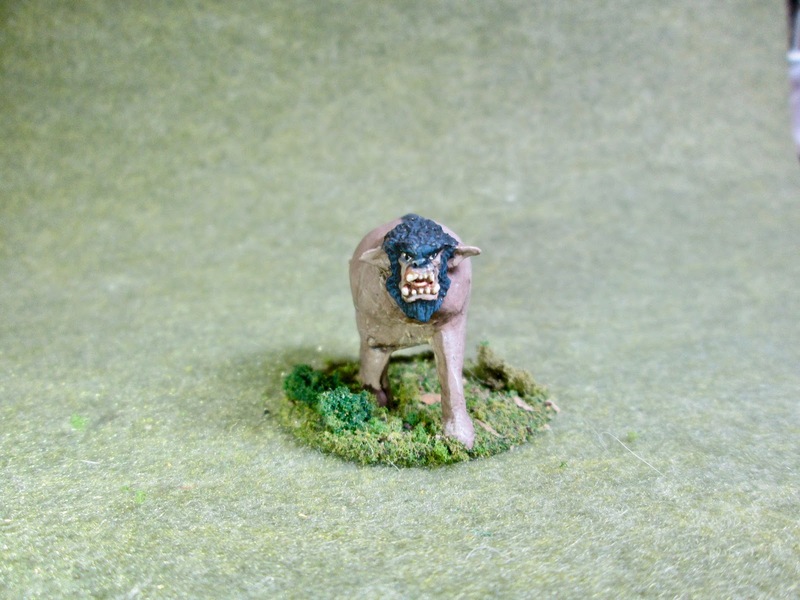 The Elf Heritor sneered at it’s repulsiveness, and shook his head in derision at the pathetic gods of these islanders. Turning back to the matters at hand, he could now make out a small cage in the distance, which seemed to be resting in a small stream. Inside the cage they could see was a man, and around it stood four Drichean Guards. Lord Fortrywn then surveyed his more immediate surroundings; he saw a large wooden totem a short distance away on their front right, and beside it set a chest and some jugs. Offerings, perhaps? He pointed to Gwyn and Bry, and then to the totem. They quietly and quickly jogged over, and when they got to the totem, the Hunter launched an arrow at one of the Drichean guards in the distance, missing, while Bry, the crew-woman, investigated the chest. Meanwhile, the Heritor had strode towards the cage and its guards, while Arbyn headed off towards their left. 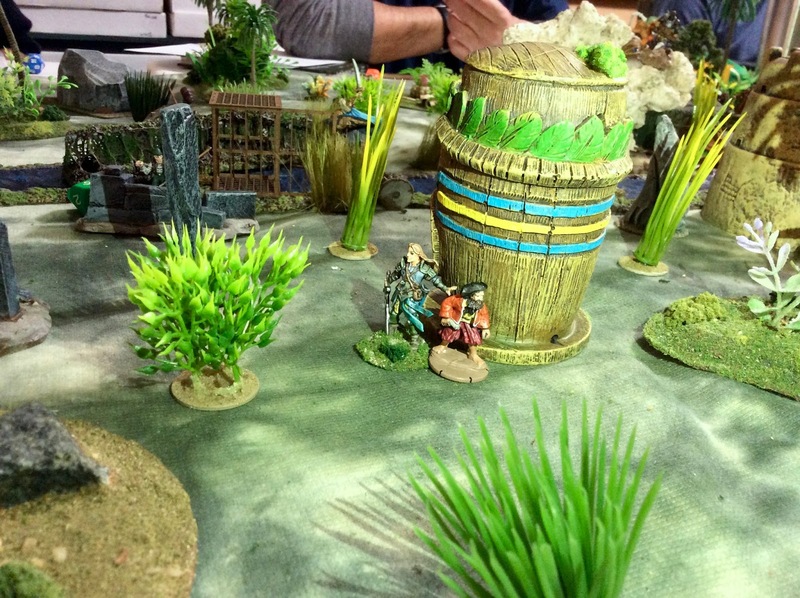 Gwyn and Bry move up the wooden totem to get the chest, as Lord Fortrywn charges towards the cage. 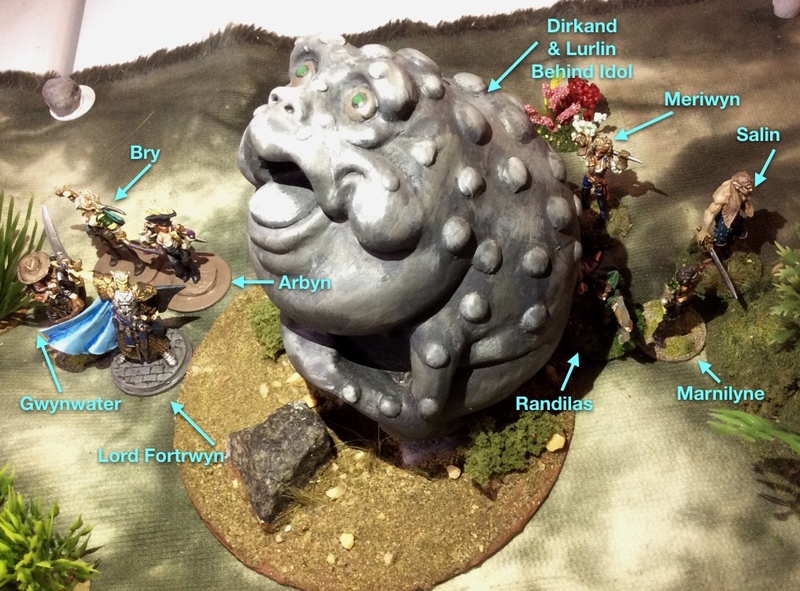 Over on the left of Lord Fortrwyn and his group, Marnilyne, the Warden, advanced with her party as well. She and the Archer, Randilas, moved to a small patch of trees and undergrowth that provided good cover, and from there she surveyed the situation. The Warden’s keen young eyes, saw movement further away behind the guards. It was another crew, coming around the cliff face. They must have the same idea that her Uncle, Lord Fortrywn, did. Quickly, she cast Brambles on the far bank of the waterfall’s pool to slow them down. As she did this, Salin advanced towards the pool, and caught site of a large bronze urn on a pedestal in the center. He was sure he saw gold glint inside. The Pearl Diver knew it would be deep in the pool, but that did not bother him at all. He plunged into the water, as enemy crewmen appeared around the end of Marny’s Brambles and they jumped into the water as well. The first one reached Salin ,and slashed clumsily at him with his sword while trying to stay afloat in the swirling pool. Somehow, the enemy’s sword made contact, and sliced a long gash into the Pearl Diver’s chest (-7 HP). Aryn and Dirkand could see what was happening and rushed to Salin’s aid. Arbyn plunged into the pool, though the crewman, Dirkland, tried his best to stay in the shallower mouth where the pool overflowed forming the stream. Suddenly a crossbow bolt hit the crewman in the back and he pitched forward into the water. (-7 HP) As he scrambled for the bank, another bolt caught him a few inches below the first and he fell unmoving, half his body still submerged in the gurgling stream. Marny chanted hurriedly seeing the desperate situation; casting Warp Weapon on the crewman facing the wounded Salin. Watery vines shot from the pool’s depths and wrapped tightly around the enemy’s sword, as he struggled to hold on to his weapon. The blade bent and then was ripped from his hand entirely, and pulled into the depths. The battle in the waterfall pool for the urn treasure. Several yards back down the stream, Lord Fortrywn had reached one of the Drichean Guards, and swinging his sword high, he brought it down upon the man with the full force of his powerful arm. The soldier received a long cut down his chest, splitting his armor, and opening his flesh . (Lord Fortrywn rolls 20) Trying to stand his ground and block, the Drichean wavered, his life leaving him. The Heritor felt his Blood Gift burn in his arms as he Surged for a second strike, bringing his sword back around and slicing the man hard again. The guard crumpled like a doll before the cleaving blade and fell to the ground. Movement caught the Elf’s eye, and he now also saw the enemy crew approaching. He spotted the black and gold armor of the Heritor Gregorious. Lord Fortrywn was not pleased at this development, and knew this interloper would have to be dealt with before the day was done. 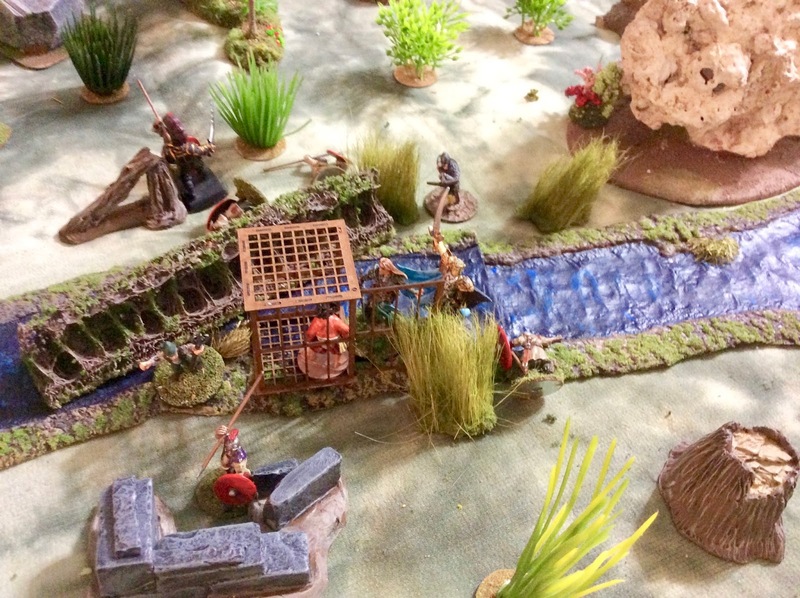 The Elf Lord also knew he must act quickly, and with his blood now like fire coursing through his body, he practically leapt the few yards over to the cage, landing with a splash into the stream. The Heritor called the crewman, Lurlin, who was nearby, to come assist him. Some distance away, Marny heard the sound of battle ringing out over on her right and turned to see what was happening with her Uncle. She could see the enemy crewmen approaching the cage as well, so quickly chanted her Bramble spell to block them from interfering with Lord Fortrywn. Thick ropy vines covered in thorns sprang from the stream bank, and rapidly coiled into a full sized hedge with dagger like spikes all over it. 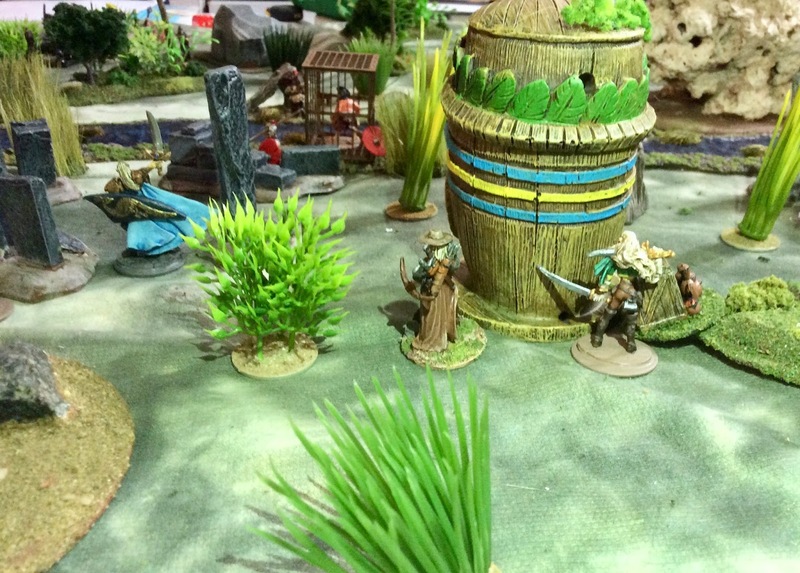 Back by the wood totem, Gwyn the Hunter had taken two more shots at the Guards and missed. The tall Elf was puzzled at this and was becoming a bit frustrated. She was not used to missing. Were the air currents being effected by the waterfall and throwing her shots off? Next to her, Bry had recovered the chest and had started dragging it back towards the rendezvous point. Overhead, the sky begin to darken with thick grey clouds. Gwyn looked up, frowning; someone had cast Cloud Cover (Missy, Gregorious’ Warden), and that certainly wasn’t going to help her archery a bit. Lord Fortrywn and Lurlin free the prisoner, as Marny "brambles” the far bank. 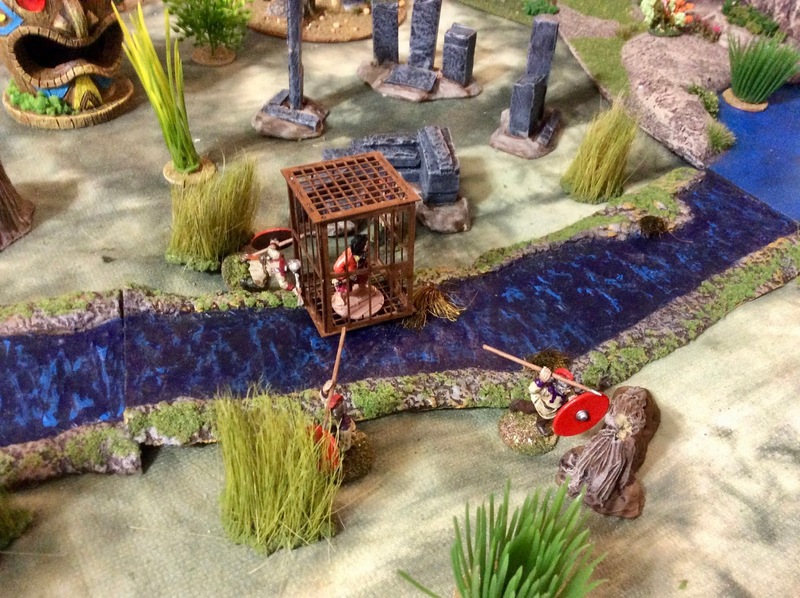 Back at the cage, Lord Fortrywn took a second to try and let the prisoner know he was there to help the man, but the poor fellow just cowered in one of the far corners staring wide eyed at the big Elf Heritor. With his blood still burning hot in his veins, Lord Fortrywn grabbed the big padlock that sealed the cage and attempted to wrench it from around the bars that held the door shut. He took a gasp of air as he pushed himself to the levels of his endurance, and with all his Heritor’s might he twisted the lock in his vice-like hands and pulled. The shank began to bend as tiny cracks developed, then with a final effort it cracked clean in two. the Elf Heritor let the remaining body of the lock drop into the stream and, swinging the barred door open, reached in to grab the prison. But the fire within him overcame him, and he faltered, leaning for a minute up against the side of the cage. (Failed roll to use Surge) “Lurlin!” he called out. The lean Elf crewman was there in a flash, but cried out as a crossbow bolt pricked at his shoulder. Lurlin’s hand instinctively went to the injury, but it was just a flesh wound, doing little more then tearing his tunic, and giving him a shallow scratch. (-1 HP) The crewman reached in and grabbed the cowering man by the arm and pulled him from the cage. Then the pair turned and Lurlin practically dragged the frightened man up onto the bank of the stream. Lurlin with the prisoner pauses to catch his breath by the wooden totem. His last breath, as it were. Meanwhile, back at the pool, Arbyn glided through the water with her sword raised, and sliced at the now-unarmed enemy crewman facing Salin. She cut a deep wound across the man’s chest. The enemy fell backwards into the water, and sank beneath the surface. The Pearl Diver, mustering what remaining strength he had, took the opportunity to swim over and grab the urn. As he did, a second of Gregorious’ crewman swam up behind Arby, and raising his sword, swung with all his might at the back of Arbyn’s head. The blade slid a bit on her wet hat, but had enough force to cut through the soggy fabric slicing a long bloody gash. She cried out and pitched forward into the water. The crew-woman’s head was on fire, and she fought to stay conscious and afloat. (Hit for 9 HP; 1 HP remaining) If it hadn’t been for her wet hat causing the sword to slide from a true hit, her head would surely have been split in two. Marnilyne, the Warden, from her vantage point in the group of trees, could see Salin in the pool with the urn, his chest was red with the wound and blood. She knew Pearl Diver couldn’t last much longer, and if the urn was lost to Gregorious’ crew it would be very bad. She reached out her hand and chanted the spell for Waters of Life at Salin, but the distance was so far, and from her vantage point she could barely see the water. The young Elf girl felt the spell failing as she was chanting it, and tried to focus her mind around the words. The Warden pushed with all her inner energy, and felt a sapping pain grow within her. (Pushes spell for -5 HP) With a gasp of pain, the Marny finished; and said a small prayer that her words had done their job. They had. The Pearl Diver felt a tingling as he stood there in the pool with the urn, and his pain and wound magically improved. However, two more of Gregorious’ crew were still in the pool, flailing about in the deep churning water. (Failed swim rolls) As Arbyn splashed about trying to find the edge of the pool one of them moved up along side of her, and awkwardly swung his weapon. It was a bad swing as the man tried to stay afloat; but the flat of the blade landed on her head near her wound, and that was enough to take her out of action. Lights flashed in the Elf’s eyes, and her head seared with pain in the few moments before blackness overtook her. The other crewman advanced on Salin. The Pearl Diver had had enough, and with his pain and having seen Arbyn and Drikand fall already, an uncharacteristic anger swelled with him. With a loud rage-filled cry he swung his sword in a wide circle, slicing into the pool, and caught the enemy crewman clean across his gut. (Rolled 18+2 F) The human clutched at his wound and sank beneath the surface. Quickly, Salin climbed from the pool with his prize, and tried to make for safety. As he went, Marny cast a wall of Brambles behind him to discourage any pursuers. As Salin makes of with the urn, Marny grows a wall of brambles behind him to discourage pursuit. As the Warden worked her magic, Randilas the Archer, standing next to her, saw Gregorious’ Crossbowmen reloading his weapon on the far bank of the pool behind Salin. The Archer drew an arrow and let it fly, striking the man, who toppled backwards. (Hit with 18 + 2 S) Randilas was then shocked to see the man, pull the arrow from his side, and slowly get back up, clutching at his wound. 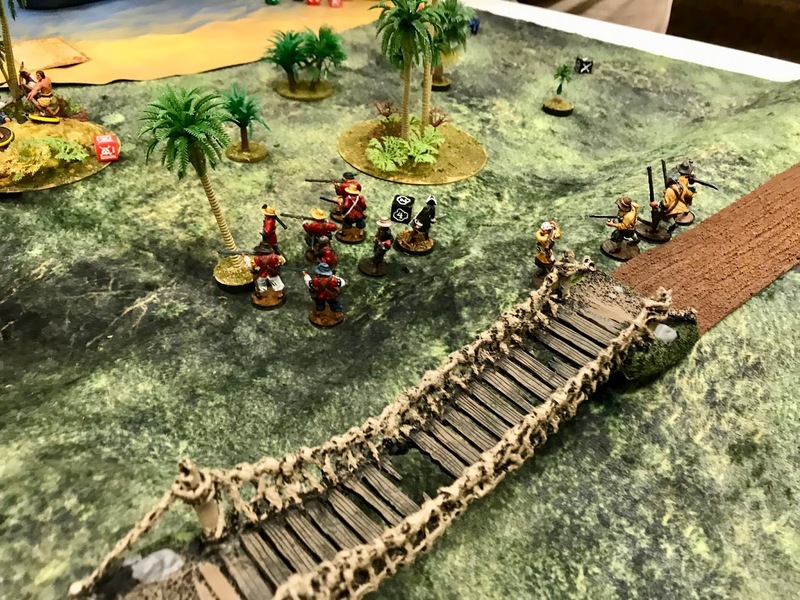 Gingerly the enemy shooter crossed over the stream, and with some effort lifted his weapon and began to aim at the Pearl Diver, but then his eye was caught by something over on his left, and his aim changed. Lurlin continued dragging the half-petrified prisoner back away from the fighting, trying to explain to the man that they were there to help. The Elf crewman didn’t know what had been said or done to the man when he was in captivity, but he was surely frightened beyond all rationality. They reached the wooden totem where Bry had recovered the treasure earlier, and Lurlin paused a moment to catch his breath, and get a better grip on the prisoner. 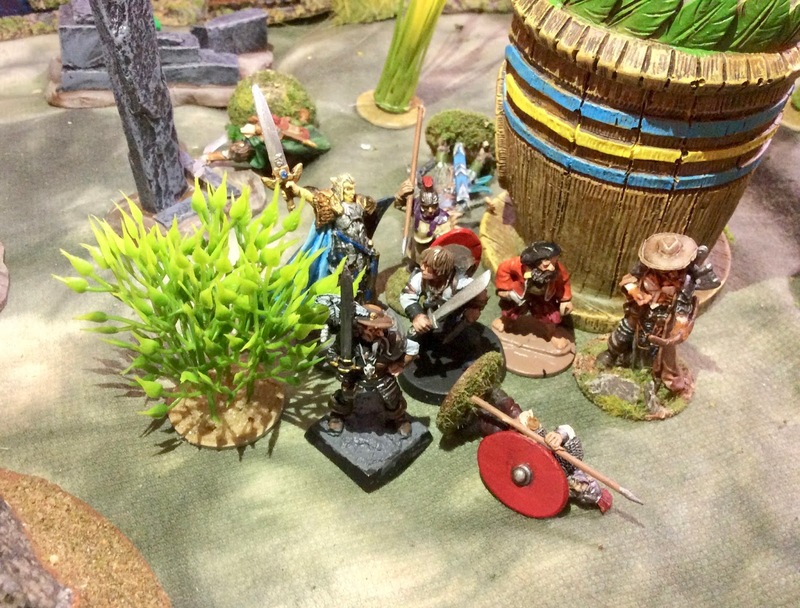 In that second of pausing, the Crossbowman over by the pool, that has been badly wounded by Randilas, fired. The bolt hit Lurlin hard in the back (Rolls an 18 +2 S), and the Elf let out a cry and pitched forward. Fortrywn’s keen ears heard his crewman’s cry, and the Heritor looked over to see Lurlin fall, and the prisoner, now unattended, cower in fright by the totem. His eyes were then caught by movement in the distance, behind where Lurlin lay; and through the jungle undergrowth, another Drichean Guard emerged, and stopping in shock at seeing their prisoner standing there free. 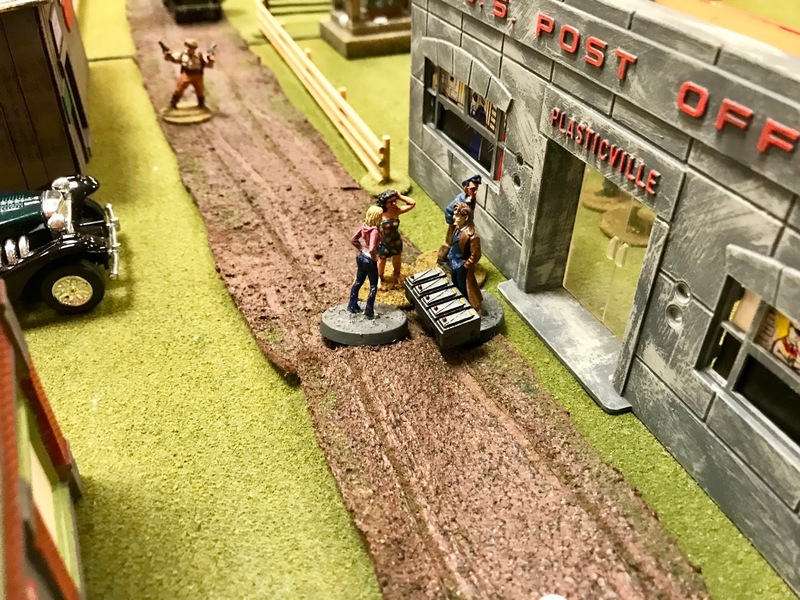 The Guard ran to recapture the man. The Elf Lord knew he had to act quickly. The Heritor, took a hasty swing at the crossbowman, who ducked and the big Elf leaned forward and simply shoved the man away. (Lord Fortrywn hits, but does no damage & pushes the Crossbowman our of combat.) The Heritor turned to run for the prisoner, but suddenly, from around a clump of tall bushes, Gregorious himself appeared. Catching sight of his old nemesis, the Human Heritor lunged at the Elf. Lord Fortrywn could see it had been a hard morning already for his new opponent, as Gregorious’ armor showed rents and splattered blood from encounters already fought. The Elf could also see the man was wounded; there was a slight limp, and blood was dripping from his left hand. A narrowing of Gregorious’ eyes, showed pain concealed behind them. 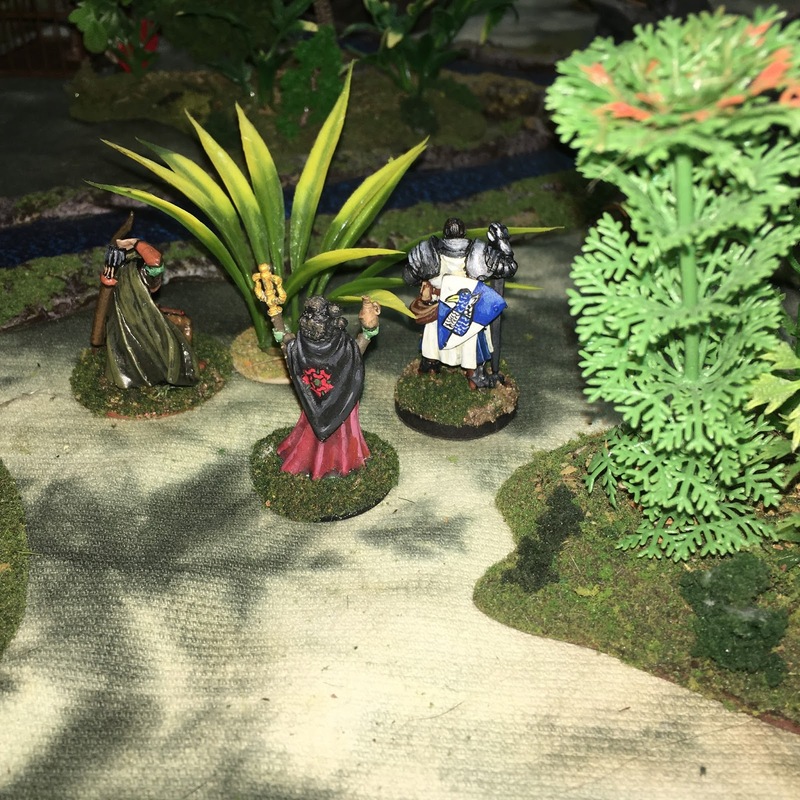 “Do you really want to do this now?” Lord Fortrywn asked with exasperation, but the Human Heritor’s pride was now at stake, and like a panther he sprang at the Elf Lord. Fortrywn blocked his blow, and bringing his sword down, drew his enemy’s blade lower; then, he quickly sliced his blade back up catching his enemy below his right arm and slicing the damage armor, cutting into his chest and then upwards across his chin. (Lord Fortrywn rolls a 20!) Gregorious stumbled backwards and his large frame hit the ground with a thud, where he lay unmoving. The Elf Heritor wasted no time with any thought for the fallen foe and, turning, prepared to reclaim his prize. Over in the clump of trees, Randilas had quickly notched another arrow, and fired again hitting the Crossbowman a second time; dropping him for good this time. But the man had already done serious damage by killing Lurlin. Marny could no longer see her uncle in the Cloud Clover induced gloom, so bounded from the trees, and towards where she last saw him. As the Heritor came into her view, she halted and cast Water of Life on him. The waters from the stream flowed towards him as he climbed the near bank, and ran up his boots and legs. He could feel the blood in his veins cool a bit. and was thankful for his Niece’s help. The Heritor didn’t get far however, before another of Gregorious’ crewmen charged at him. 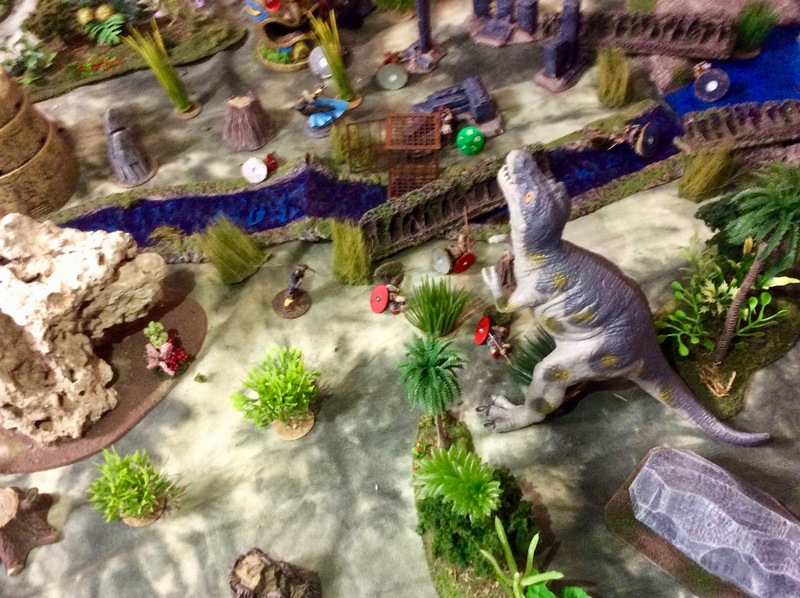 Taking the Elf Lord by surprise, the man got a lucky hit, and sliced the Heriot across the arm (-7 HP). But the man lost his nerve, and moved back away from Lord Fortrywn, where he came face to face with a remaining Guard for the cage. The Drichean made short work of the cowardly crewman. Lord Fortrywn had already turned from the encounter and headed again towards the prisoner. 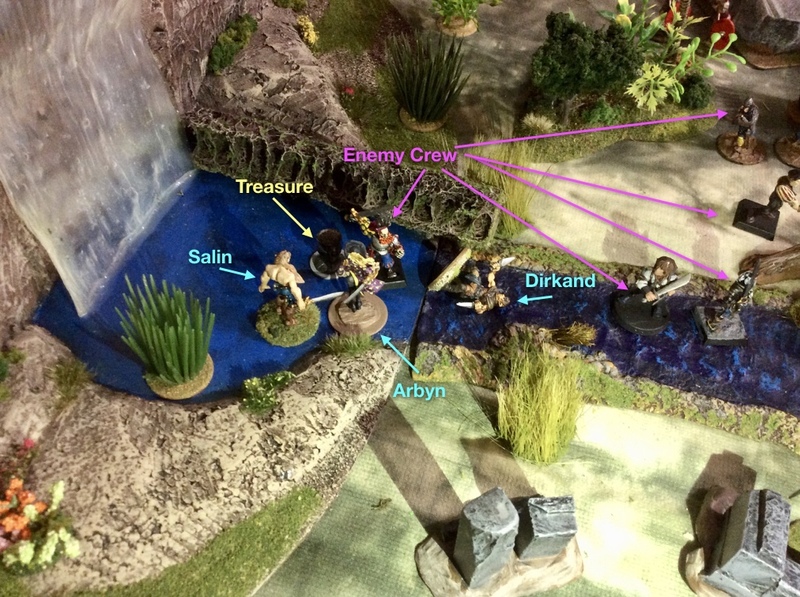 Another enemy crewman approached the area, and Randilas shot at him, but missed. Desperate, the Elf Archer shouldered his bow, and drawing his dagger ran at the target. A chill went through everyone’s spines as the Monarch roared again. They could all tell it was closer now, but the fighting continued. The crewman facing Randilas, swung with his sword as the Archer approached, and the dagger proved a poor defense as the man stabbed with all his might. He caught the Elf right below the ribs on his right, and the blade went deep. Randilas pitched forward with his own momentum, and lay there in the grass at the man’s feet. 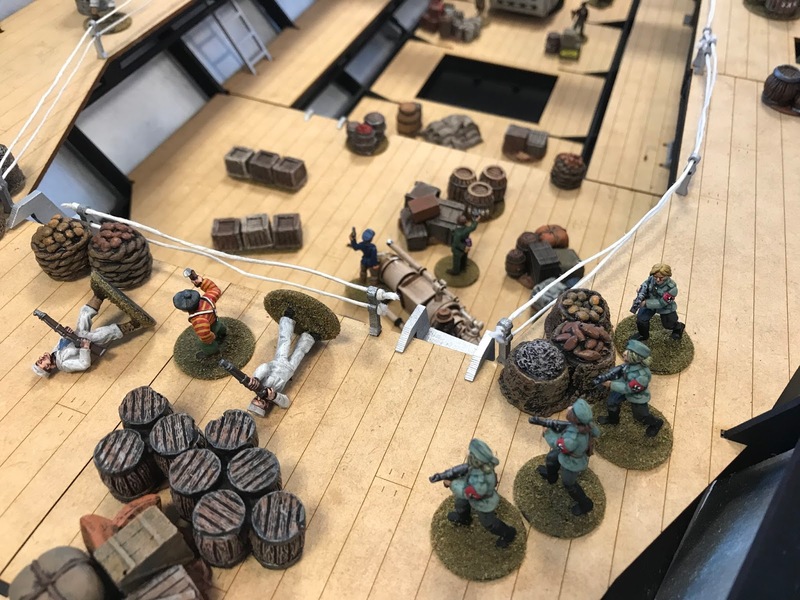 The enemy crewman jumped over the body, and ran towards the prisoner. Another enemy crewman, from the pool, followed close behind. Te Monarch advances towards the cage. The Elves could now feel the vibrations of the ground from the Monarch’s large feet as the huge lizard strode ever closer. In a moment there was a crashing on the far side of the river and the monster came into view through the trees no more than 20 yards from the bank of the stream, looking for it’s expected meal. Gwyn could see the enemy crewman approaching and sliced once more at the new Guard, hitting him, but his armor held and protected him this time. The Hunter was relieved to see Lord Fortrywn run up to the scene, as one of the enemy crewman arrived and stabbed the Guard, finishing him off. As he did this, Gwyn quickly sheathed her sword and notched an arrow, firing at the crewman as he drew his sword from the Guard’s body, hitting the crewman and sending him spinning fully around, before he fell to the ground. 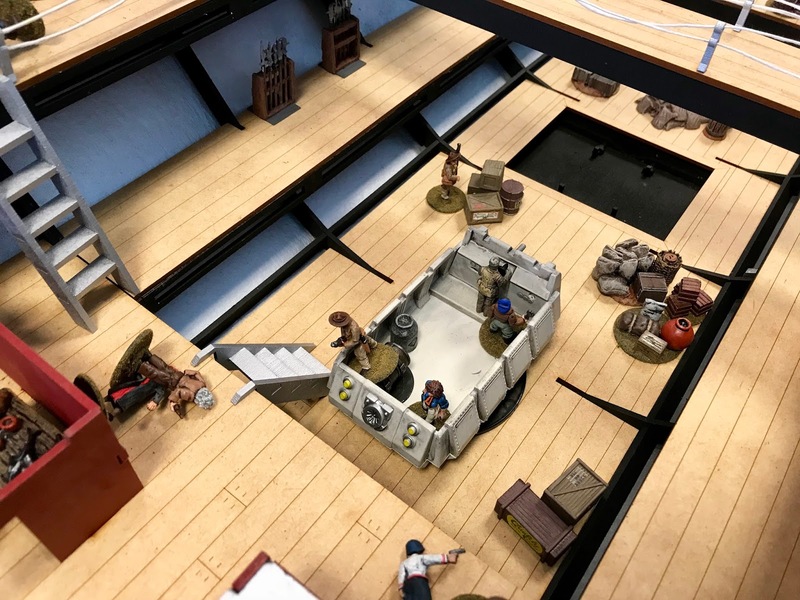 Quickly she notched another arrow, as the lone remaining Guard from the cage was now moving up behind Lord Fortrywn, as the Heritor prepared to strike the remaining enemy crewman. The Elf Lord struck a mighty blow at the man, stabbing deep into the man’s gut. (Rolled 15 + 5 F). The crewman crumpled over. The Hunter fired at the approachingGuard as he was just a couple feet behind Lord Fortrywn, his spear poised to strike, and the arrow sunk deep into the man’s neck, right above his armor. But he somehow kept coming (1 HP remaining) , and prepared to stab the Heritor in the back. Gwyn shouted a warning, and Lord Fortrywn turned quickly, striking first, and the weakened man could barely offer any defense. With an easy stroke of his sword the Heritor laid the last Drichean low. All through the fight, the poor prisoner had huddled up against the totem, sobbing and trying not to be hit by all the flashing blades. Every time the ever-nearing Monarch roared, he let out a long wail, punctuated by the unceasing sobbing. The battle at the wooden totem. Gregorious’ men have the black bases, the Guards have the red shields. As the fight was ending, Marny ran up to help. While the others hurriedly cleaned and sheathed their weapons, she went over to the prisoner , and taking him by the arm, tried gently but urgently, with soothing words, to get the quivering, sobbing, man to stand and go with them. They all knew the Monarch was very close now. In fact they could see him on the far bank of the stream less than 100 yards away. "Quickly!“ Lord Fortrywn said to his Niece. The Heritor looked around at the carnage. It seemed like there was no one left from Gregorious’ crew. He surmised that they were probably all out of action, or ran at the sight of the Monarch. But he was wrong. 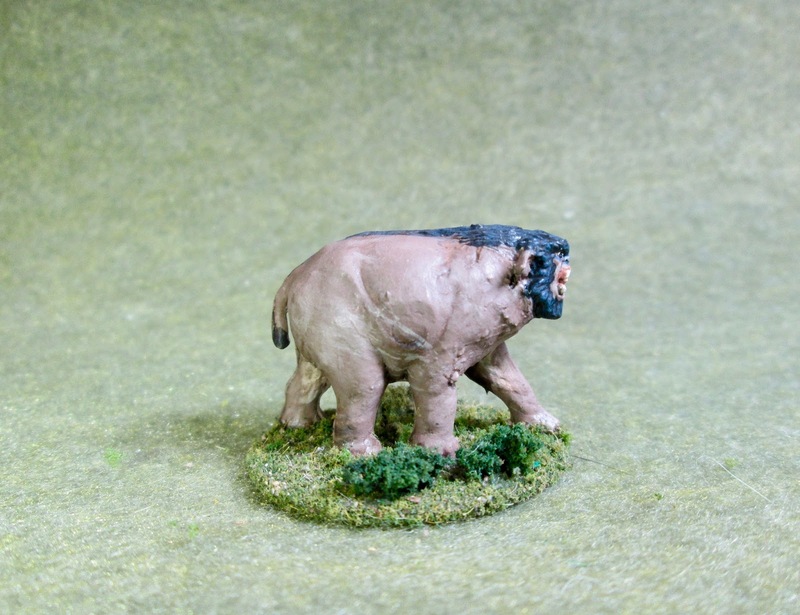 On the far bank of the stream, in the shadow of the Monarch, stood a lone Crossbowman; the one Lord Fortrywn had wounded after opening the cage. Somehow the man knew he was the last one of his party still standing. He could see his once proud Heritor laying a short way away in the grass, bloodied and groaning. The man knew the rest of his party were laying somewhere dead or wounded as well. As the Crossbowman finished cranking his crossbow, he raised the weapon and inserted a bolt . He splashed over to the near side the stream to get a better view of his targets in the gloomy Cloud Cover. The man could sense the Monarch moving up just a few feet behind him on the far bank. He could hear it’s large nostrils sniffing it’s prey, and smell its fetid breath descending on him. He no longer cared about his life; but he did care about those who had inflicted this fate on his group. Closing one eye, he sighted down his weapon at he cluster of Elves less than 100 yards away. He saw movement as one of them stood up, and his eye focused on the motion. He pulled the trigger, as the horrid breath of the beast was right above him, and a drop of sticky saliva dropped onto his head. Marny’s words of comfort had reached the prisoner, and slowly she stood as the man came with her. Without thinking, she gave a tired smile at her uncle, proud of her success. Then, suddenly, the smile turned to a look of shock and pain, and the young Elf let out a gurgling sound and pitched forward with the spike of a crossbow bolt sticking squarely from the back of her jacket. The prisoner shrieked as the body hit hit the ground at his feet, and he cowered down again against the totem. Lord Fortrywn instinctively drew his sword, and turned towards the source of the shot. He saw the enemy Crossbowman just as the Monarch’s jaws closed around him and lifted the man off the ground as if he hardly weighed anything. The Heritor knew there was nothing he could do about the shooter now, and hastily he turned back and knelt by his Niece. 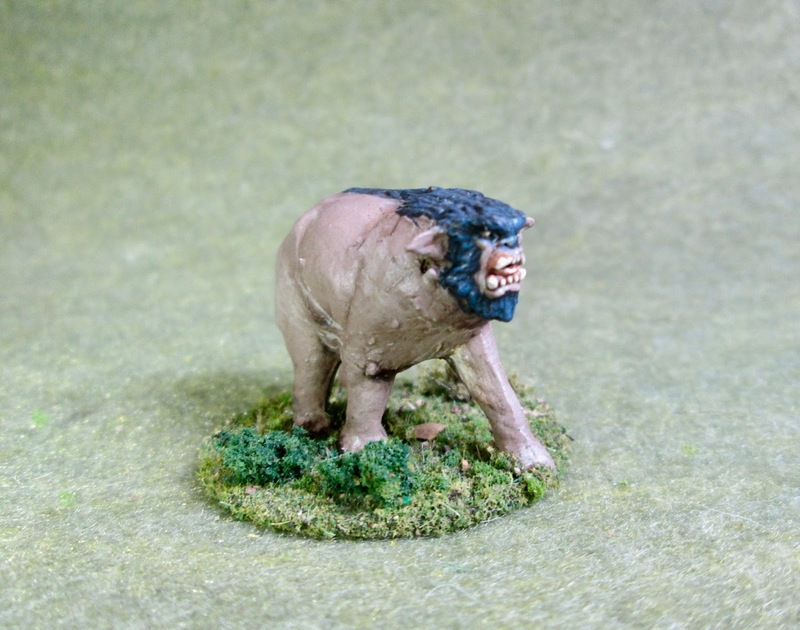 In the distance the beast roared, and they could hear it’s large feet splash into the creek. The Elf Lord scooped up the girl in his strong arms, her breaths coming slow and wheezing. To Gwyn the Hunter he said through gritted teeth, "The Prisoner." The tall Elf woman pulled at the man with all her might, but he was lost; he sobbed and wailed and clawed at the totem as if trying to burrow inside. She knew they had seconds before the monster would be there, and even with her skill she knew she was no match for something so large. And the Hunter realized she was virtually alone, as Lord Fortrywn was already far ahead, practically bounding through the jungle with the wounded Warden. With a grunt of disgust the Hunter let go of the man, and turned to follow her Heritor back to the ship. The Monarch prepares to dine on the Crossbowman as the man lines up his last shot. Back on the ship, The Silver Sword, later that night, Lord Fortrywn stood over his Niece as she lay there in her cot. She was as white as the bandages which wrapped around her chest, and her breathing was shallow and raspy. The ship’s healer had done all she could, but in her words it had been "a very close call”. If it had taken the Elf Lord just a few minutes more to get her back to the ship all would have been lost. The Heritor stayed in the girl’s room into the evening, and it was there that Gwyn found him late in the night. The Hunter ashamedly reported her failure in bringing the prisoner with her, and was surprised when Lord Fortrywn seemed not to care. He was strangely distant and lost in thought. Gwyn also reported that other than Marnilyne’s close call; Lurlin the crewman had not returned and was presumed dead, and crewman Dirkand was badly wounded. The others who had fallen during the day, Randilas, and Arbyn, would be fine with a bit of rest and medical attention. The two treasures they recovered had contained 40 Gold Coins, a magic two-handed sword (+1F), and a superior quality dagger (+1 damage). Lord Fortrywn nodded and thanked the Hunter, but his mind was with his Niece. He thought back and tried to find what he could have done to protect her better. She was so cavalier, and head strong, it was hard to keep the girl in check sometimes. He couldn’t help but smile inwardly as he realized she was much like he was in his foolish youth. The Elf’s mind traced back over those sunny days as a young officer as his eyes slowly closed and the Heritor drifted to sleep as he sat there in a small chair at the foot of his Niece’s cot. So close… I almost had it! What a great game! I came so close to getting the Central Treasure (the prisoner). The final minutes were so exciting as Gregorious and I fought tooth and nail for control of the prize. At last it seemed victory was mine, as I disabled all his troops in the vicinity. But both Gwyn and Lord Fortrywn had activated, and I knew the game was almost over. Who could I get there in time to actually grab the prisoner? And then I saw the Warden. I measured; yes, she was within a 6" move of the prisoner. the Warden Phase came and I moved her over to the prisoner, her second action was picking the “treasure” up. Then came the Soldier phase. Surely, Gregorious would attempt to move his crossbowman to safety. Nope. 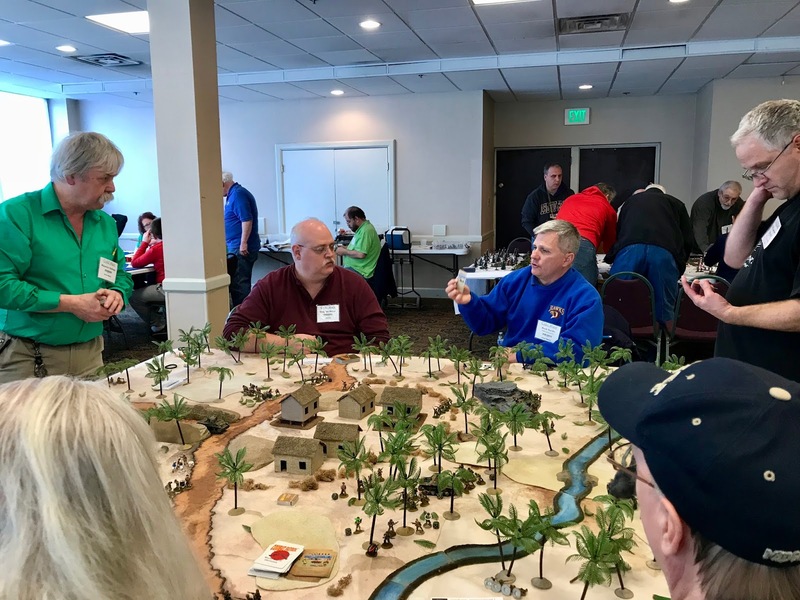 He announces he wass going to take a Hail Mary shot at the maximum sight range for the Cloud Cover, and sacrifice his last figure to deny the treasure to me. I was confident he’d miss. I was wrong. And I had sacrificed a lot of he Warden’s HP to “push” spells, thinking she would never be involved in any real combat. Down she went. I had one last hope; if the Monarch actually lost the combat with the Crossbowman, the game wouldn’t end in the Creature Phase, and I’d get another chance to grab the prize. 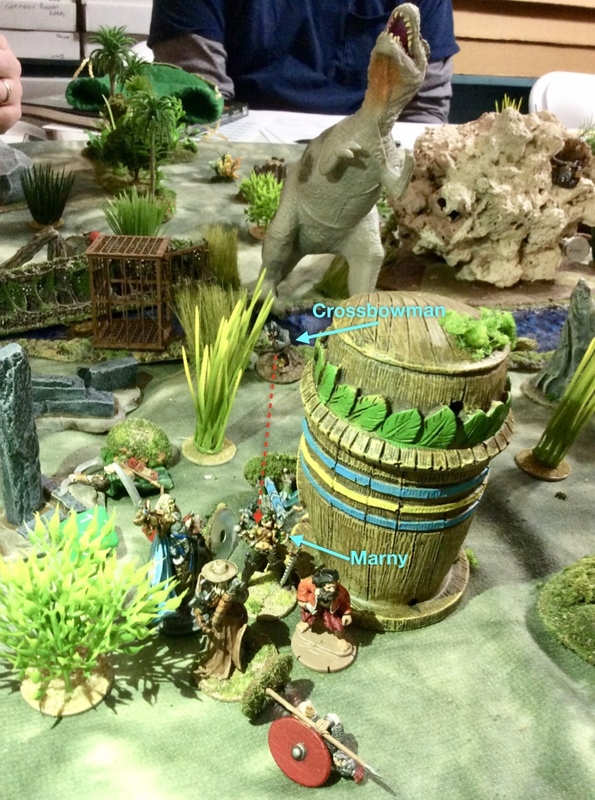 But, no, I rolled the attack against the Crossbow for the beast, and rolled a 16, plus the Monarch’s Fight +8. 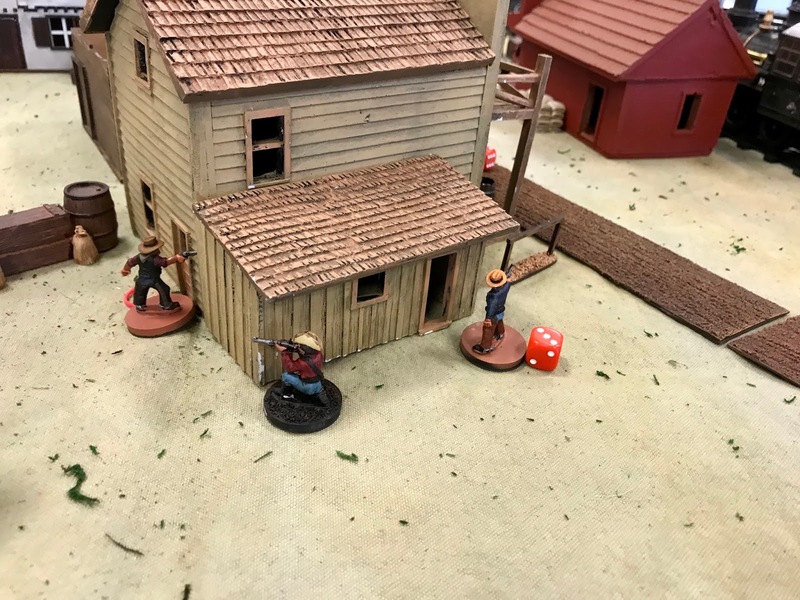 It was more than enough to kill the wounded man, and with that being Gregorious’ last figure on the table gone, the game ended. All in all though, it was a pretty good game for me. My dice rolling was actually on the good side, with a lot of nice 18s or 20s when I needed them. And I got two treasures, which is a step in the right direction for me. Also, the Experience Points for killing a couple Drichean Guards, and freeing the prisoner helped. The game was interesting in that it devolved into three distinct player vs player battles. There didn’t seem to be any of the sniping on the flanks, at least down by our end, that we usually see. 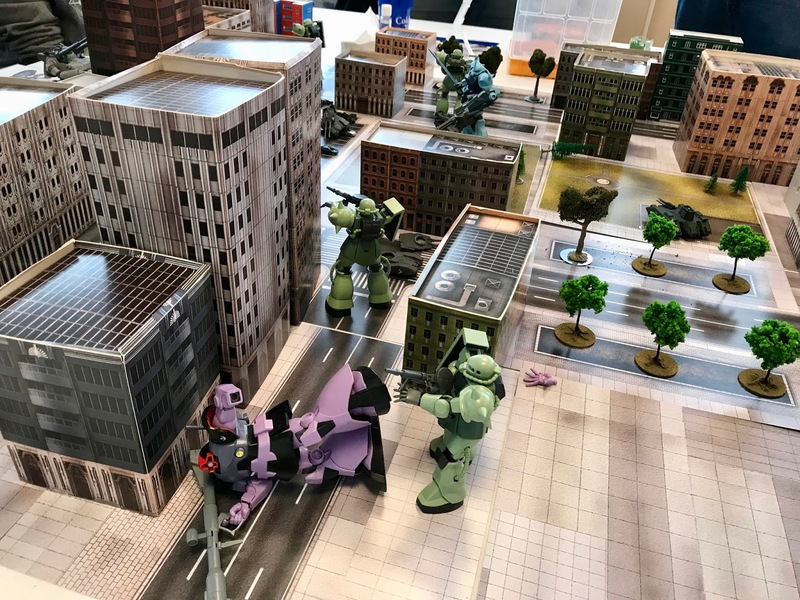 I’m not sure if that was a function of terrain, or the immediate need to deal with the four Guards in the center of the table. It was also interesting that I was the only one to actually free one of the prisoners. 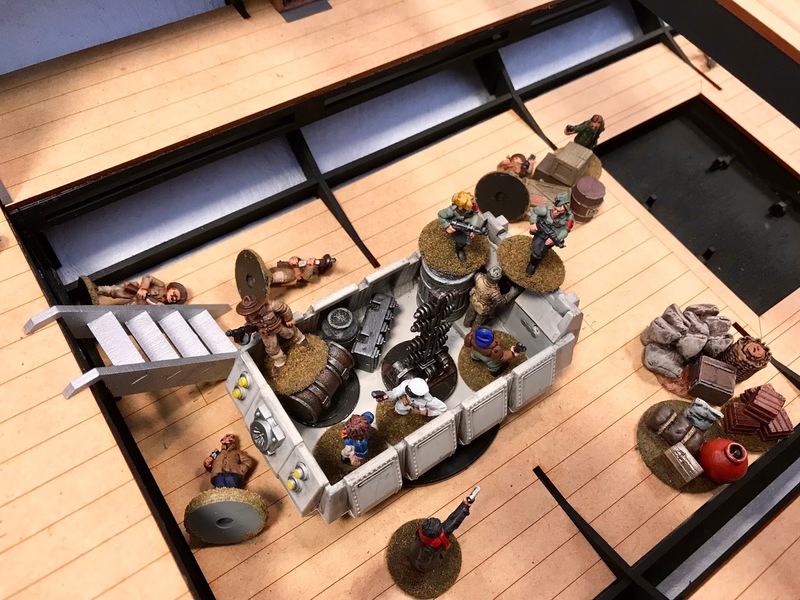 At the other cages, the Guards put up more of a fight, and the opposing crews’ missile troops kept each other at bay from getting too close to the prisoners. The next game is in just two weeks, and Lord Fortrywn is looking forward to testing his mettle once again. We feel the tide has turned in his favor! Stay tuned! 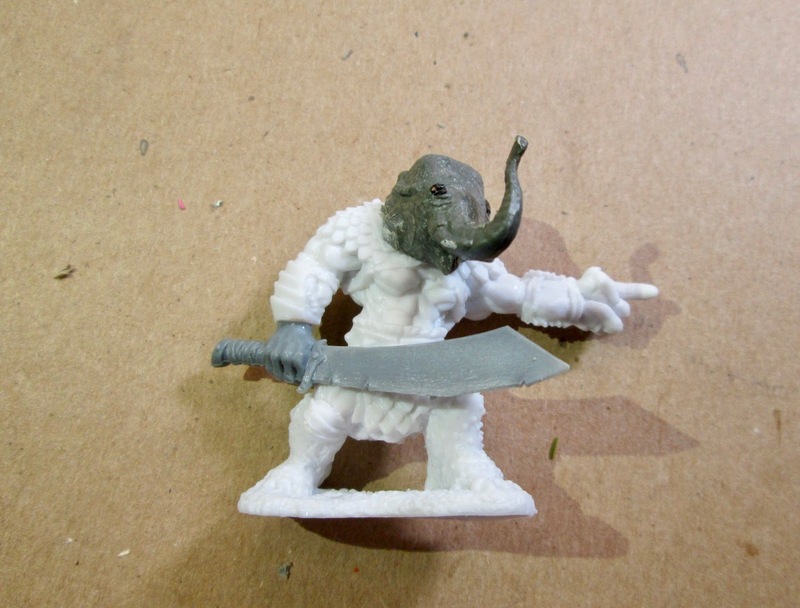 I found the elephant and the Bugbear, but I had borrowed the Bugbear’s weapon hand for an Orc a while back. 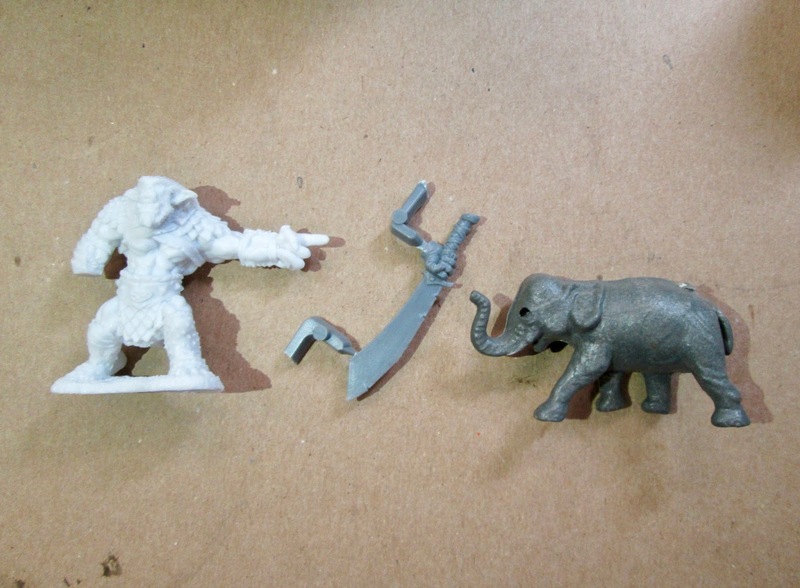 So, a quick dig in the bits box, and I came up with what I believe is a GW Ogre weapon hand. A little bit of sawing, and I had this. It was just a matter of gluing it all together then. 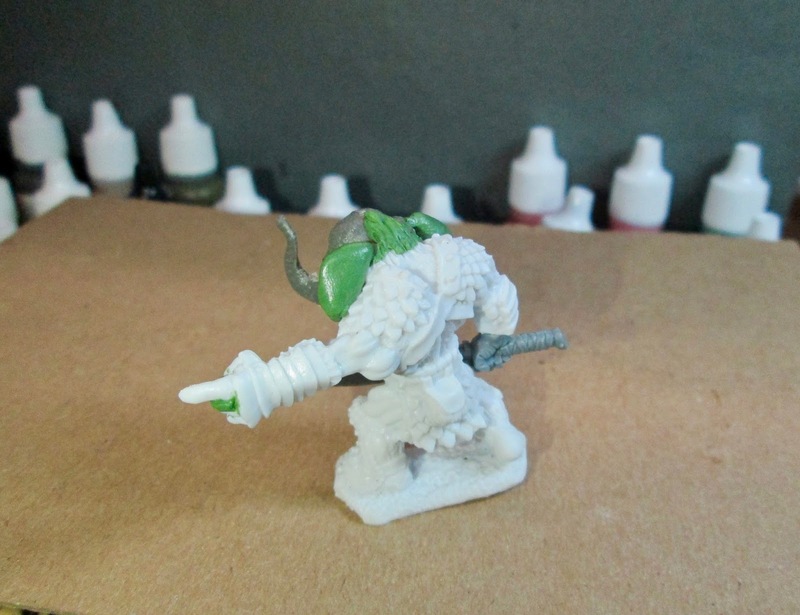 I then used some greenstuff around the head to blend it to the body, and added some ears. 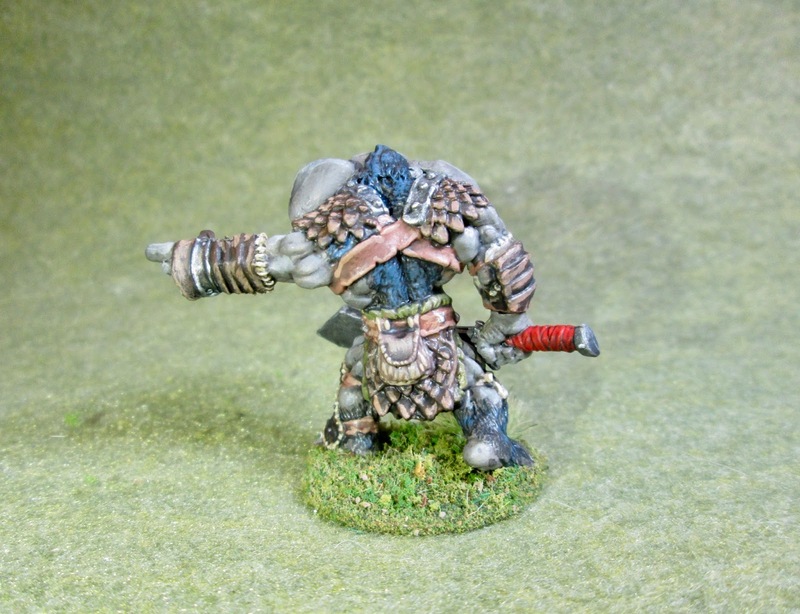 Another problem was his Bugbear hand only had four fingers and his ogre hand had five fingers. 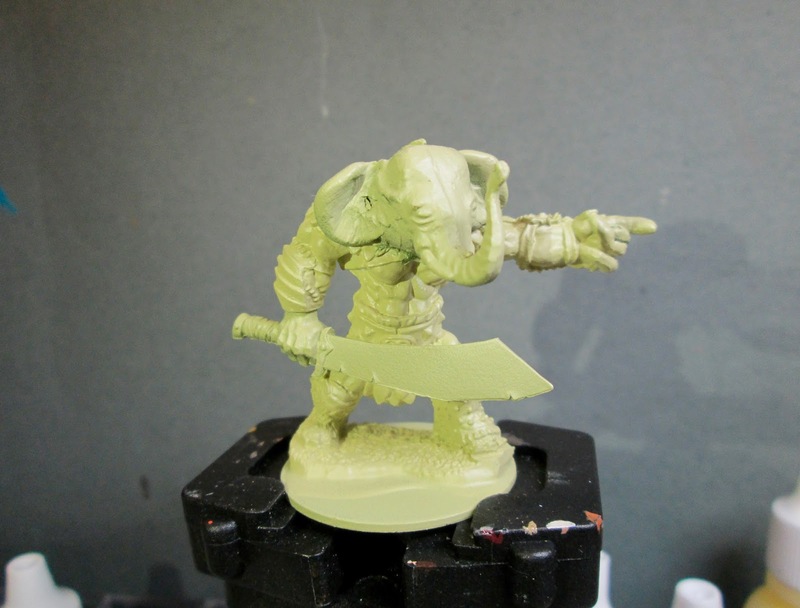 Considering the problem, and the fact I had already glued everything together, I decided adding an extra finger with greenstuff was the easiest solution. I also added some hair to the top of his head, and tried to blend it in to the hair on his back. 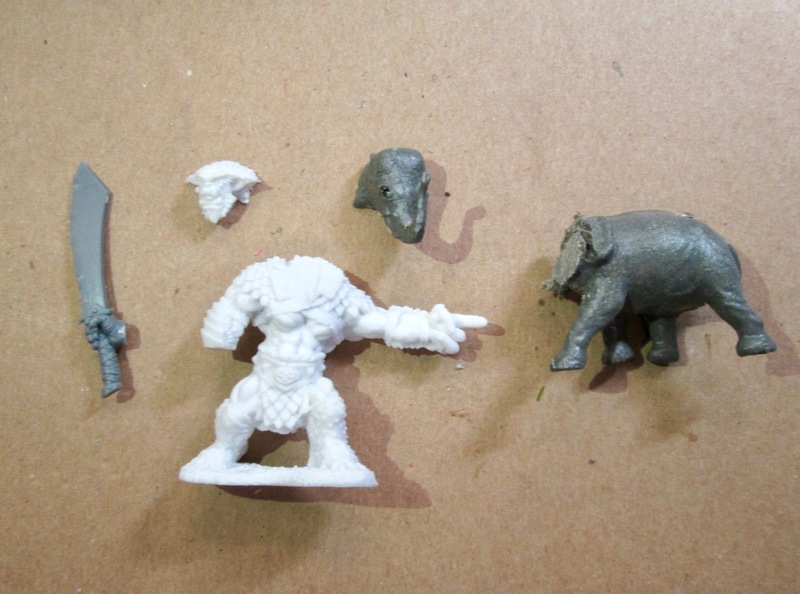 Lastly, I clipped the claws on his feet to make them look more like elephant toenails. Satisfied with the conversion, I decided to spray the figure with some Army Painter “Necrotic Flesh”. I choose this because I had it on hand, and I’ve found Army Painter primer to be the best option to be a safe primer for multiple types of plastics, including Bones; not because I particularly thought the color was the best option. 🙂 . I began by painting all his skin with Folk Art “Medium Grey”, and then painted his scale armor with Americana “Raw Umber”. 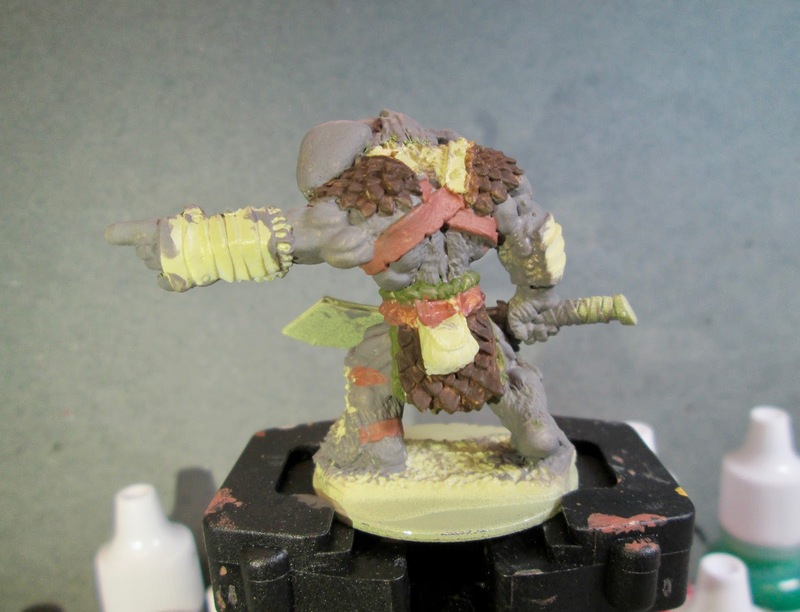 I then painted his belts and straps with Folk Art “Teddy Bear Brown"and his loin cloth with Duncan "Olive Green”. Next, I decided I wanted all his armor to be the same color, so I also painted his arm guards and his shin guard with the “Raw Umber”. I then painted the cloth/fur under his arm guards and shin guard with Folk Art “Butter Pecan”, and the bandage? around his right knee with Americana “Khaki Tan”. After that, I painted his hair with Black, and then painted the pouch around on the back with Americana “Mississippi Mud”. I then painted the sword blade, and his back shoulder armor with Americana “Zinc” and the grip on his sword with Reaper MSP “Pumpkin Orange”. I decided I didn’t like the orange sword grip, so repainted it with Reaper MSP Bones “Cinnamon Red”. 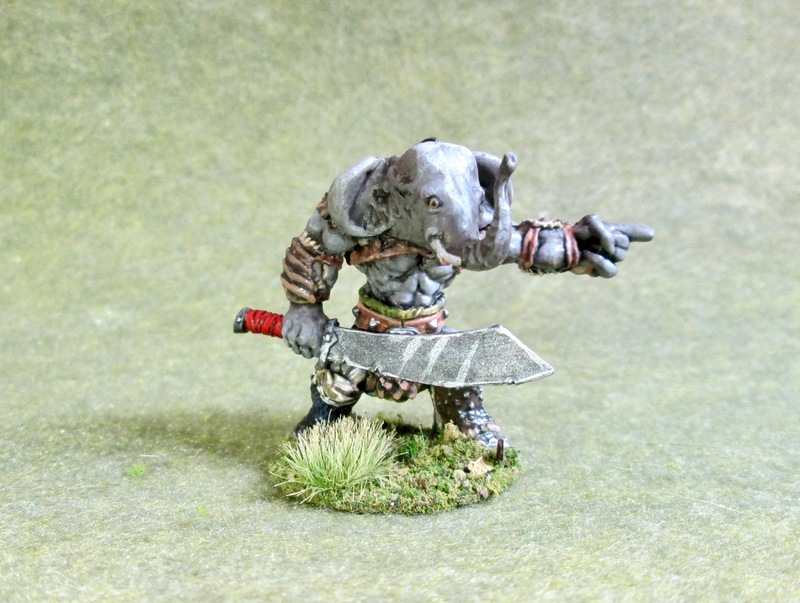 I then painted his tusks with Americana “Dove Grey”, and his sword blade with Folk Art Metallics “Gunmetal Grey”. After everything had a while to dry, I gave the whole figure a wash with Citadel “Nuln Oil” wash. When the wash was dry, I painted his eyes, and then worked on highlighting his hair using Citadel “The Fang”. 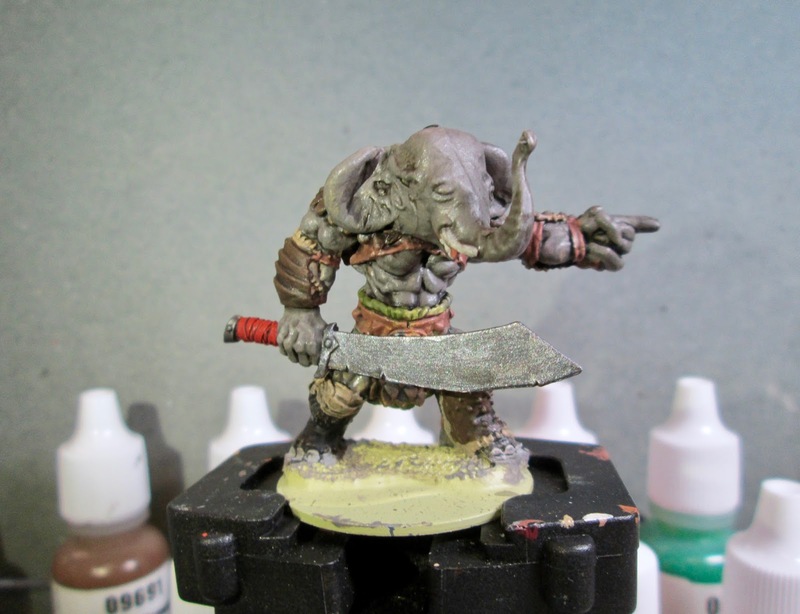 After that, I highlighted his skin using Crafter’s Acrylic “Storm Cloud Grey”, and then highlighted his tusks using the base “Dove Grey”. I then highlighted his armor with Americana, Sable Brown, and his belts with Americana Shading Flesh". For his pouch around back I highlighted with Reaper MSP “Tanned Shadow”, and then highlighted his sword grip with Reaper MSP “Holly Berry”. 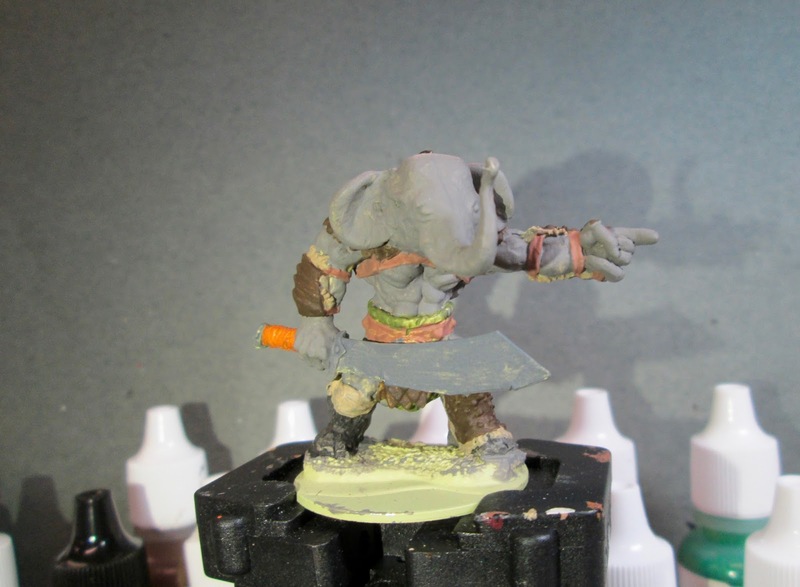 Next, I highlighted the fur under his arm and shin guards using Americana “Antique White”, and highlighted the bandage on his right knee with Americana “Bleached Sand”. Lastly, I highlighted all the metal bits with Ceramcoat “Metallic Silver”, and then I painted the figure’s base with Americana “Bittersweet Chocolate”. I let the figure dry overnight and the next day I gave it a coat of Americana “DuraClear Matte” varnish. Then, when the varnish was dry, I used some white glue to flock the bases. Another overnight dry, and I sprayed him with Testor’s Dullcote". I’m really happy with how this conversion turned out! The head seems to go perfectly with the body. The ears are probably the weakest point, I should have studied some photos first before sculpting them. On Wednesday I finished the back rank Saxons for this group of old Minifigs (NS range). 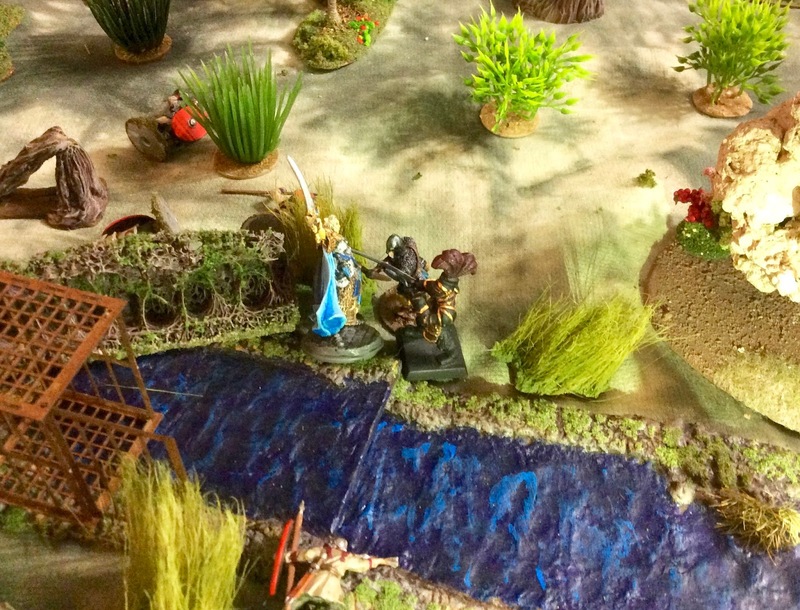 In Dragon Rampant terms, the two elf units on the left will be light foot with mixed weapons (i.e. 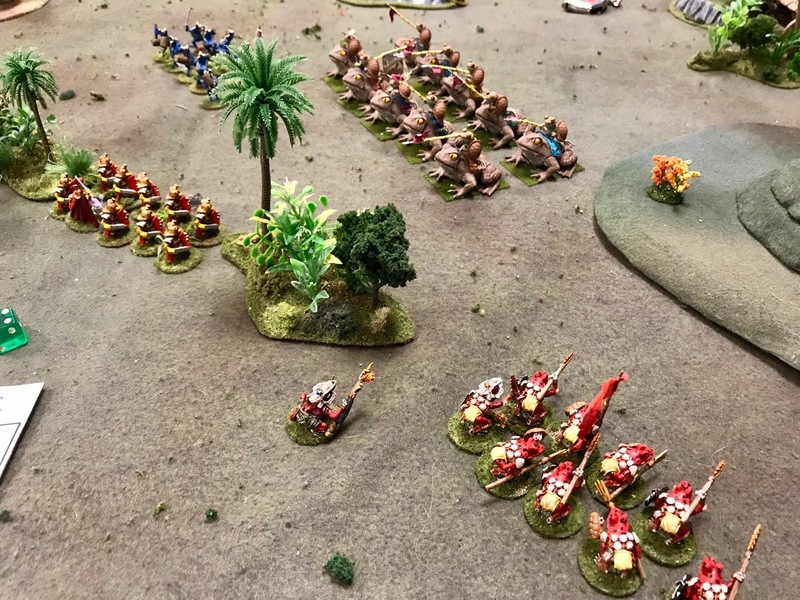 bows and swords) at 5 points apiece; the elf king and guard will be a “reduced model count” heavy foot unit (rated more for skill than for armor) at 4 points; the dwarves elite foot at 6 points, and the humans another light foot at 3 points. That adds to 23 points, so I suppose the dwarves will use the odd point for enchanted weapons (usually useless) to bring the band up to the “standard” 24 point starter level. 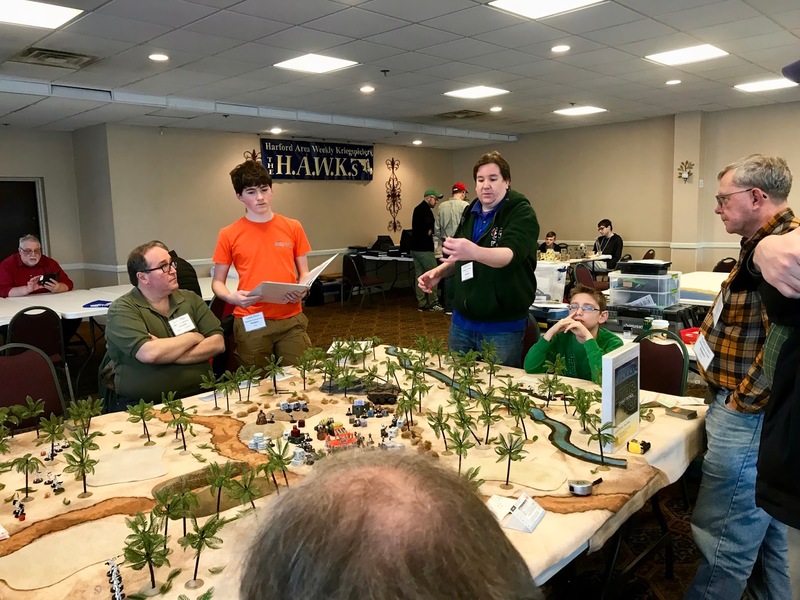 Senior son Norman came up for a visit this weekend, and had the opportunity to join the monthly Ghost Archipelago campaign game currently running among the HAWKs. 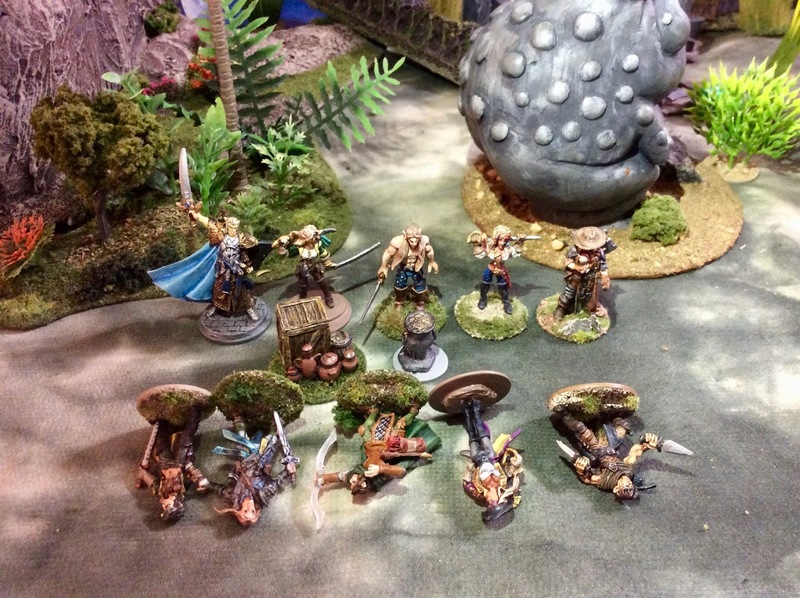 He’s been busily painting a bunch of Reaper Bones fantasy figures, so was able to field a crew of his own. I am finally caught up with paperwork for this as well, and also fielded a Reaper crew, containing as many of my Gencon speed painting competition figures as I could. Six crews headed into the Lost Isles in search of various prisoners being held by the local bronze age petty kingdoms. 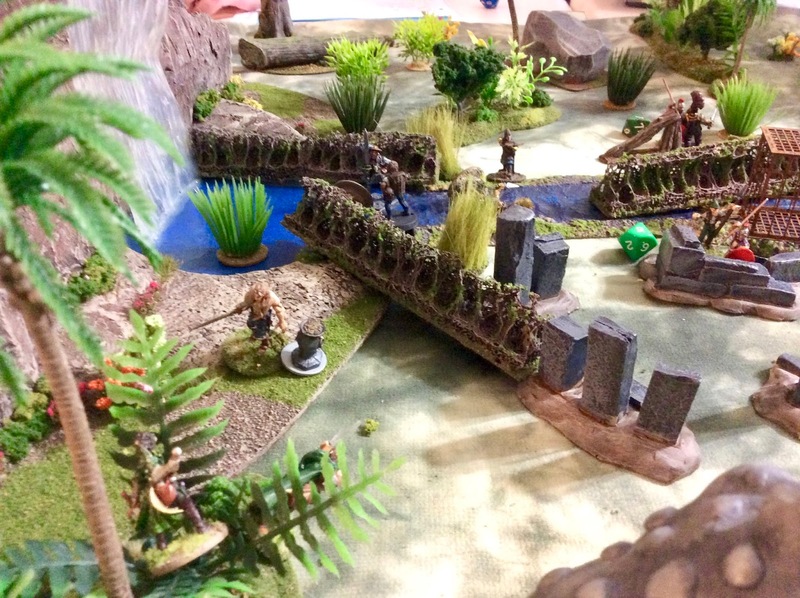 One of the nice things about being part of a club is the availability of large amounts of scenery, which is very helpful for Frostgrave and Ghost Archipelago, both of which call for very cluttered boards. I’ll leave the storytelling to the more talented members of the club, but it was a very good day for my Heritor. His ability to throw large rocks downed the opposing Heritor who was contesting the prisoner cage with me, but the game ended before I was actually able to collect the prisoner. 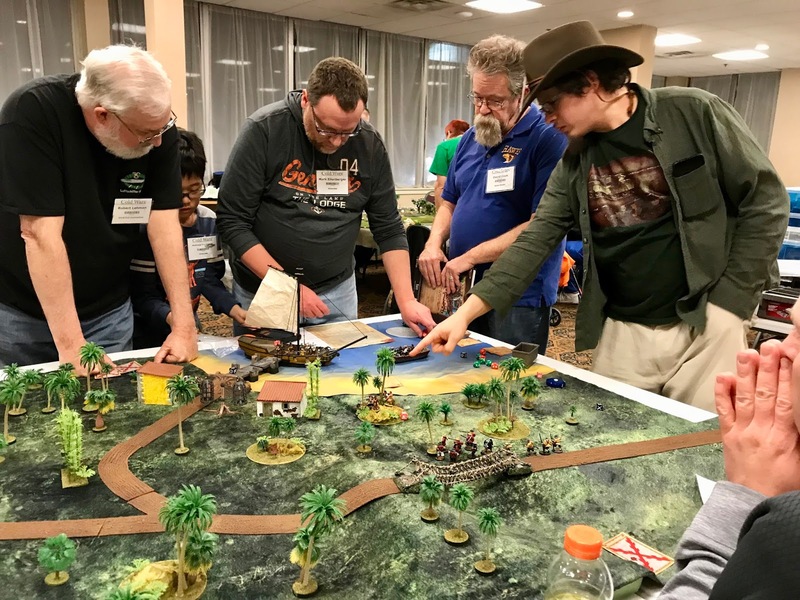 Our Frostgrave games had gotten to be a bit diplomatic; Ghost Archipelago seems designed to encourage direct conflict among the crews, so makes for a better game, in my opinion. 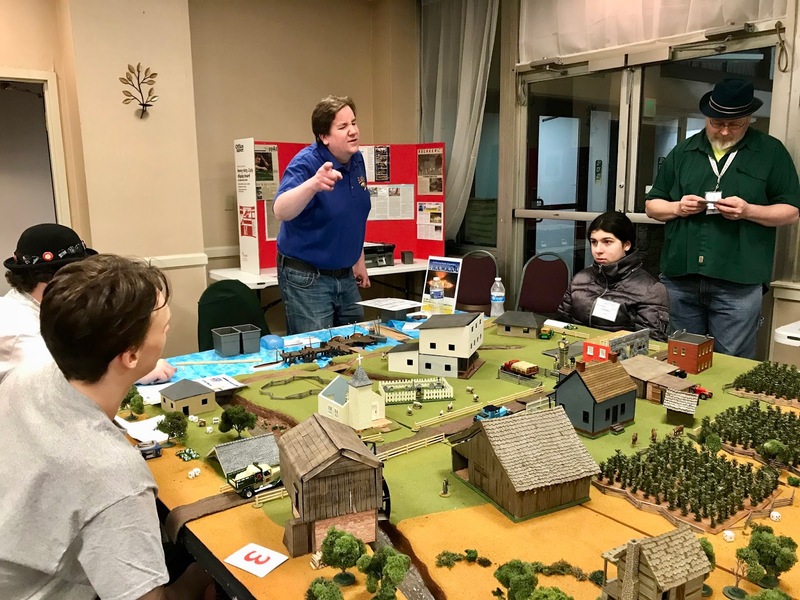 After the Ghost Archipelago game, Norman and I put a small Dark Ages game on the dining room table, using the Osprey rules Dux Bellorum. We have tried the game before. I hadn’t intended to take five years to get it back on the table, but sometimes these things happen. 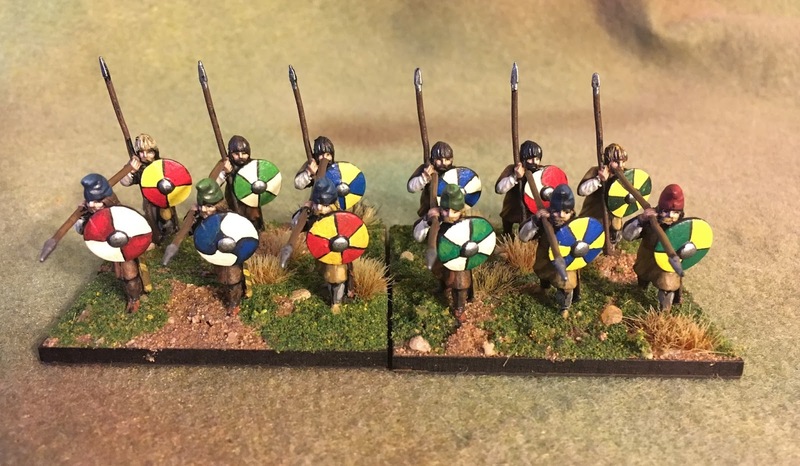 In the intervening years, I have been gradually painting away at various home cast figures (most Prince August) for the Saxons, and Ross Macfarlane gave me some vintage figures he wasn’t using as the core of a Romano-British band. 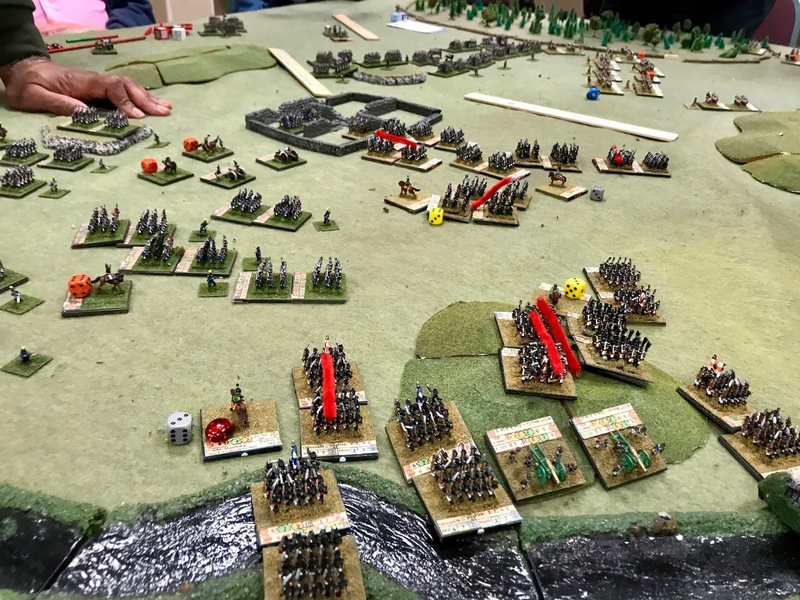 While I painted some Romano-British cavalry skirmishers on Wednesday, the only new figures used in this battle were the massed archers, seen at the far right of the overview picture, just entering the bog. 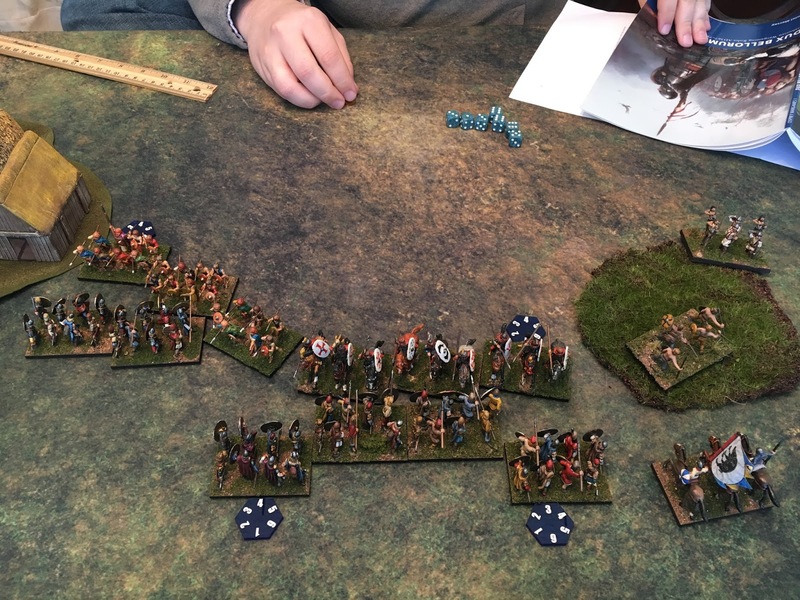 Norman decided that if he was investing most of his points in his noble cavalry on imposing horses, he was just going to run down the Saxon invaders, and so it was. As it turned out, the ability of his ordinary shield wall troops on his right flank to withstand the charge of the Saxon nobles was important as well, but most of the damage was in fact done by his charging horse. On our way down to the Ghost Archipelago game we had a chat about what made a game interesting or not, and Norman’s point was that he liked to play the game and be in control. 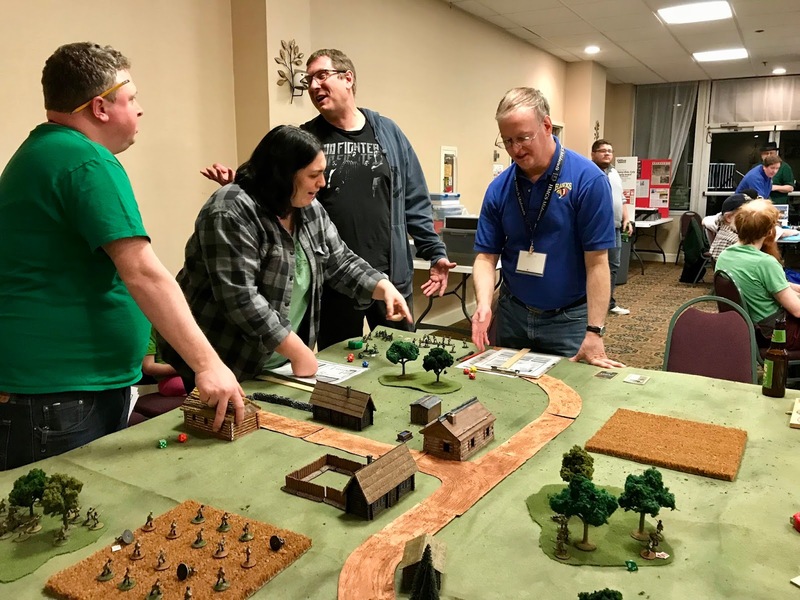 The opposite position would be that one liked to see the battle simulated, which could involve a loss of player control due to activation rolls, contagious morale, or similar mechanics. 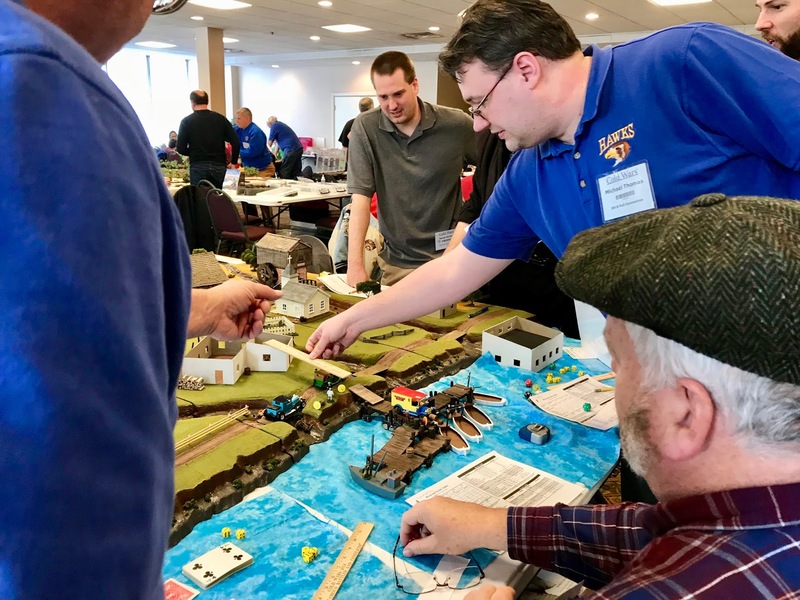 We noted that Dux Bellorum gives enough player control to be a reasonable game to his tastes, mostly through the mechanism of allocating the abstracted leadership points. As can be seen by the picture, most of what is happening on the ground is a fairly linear clash. 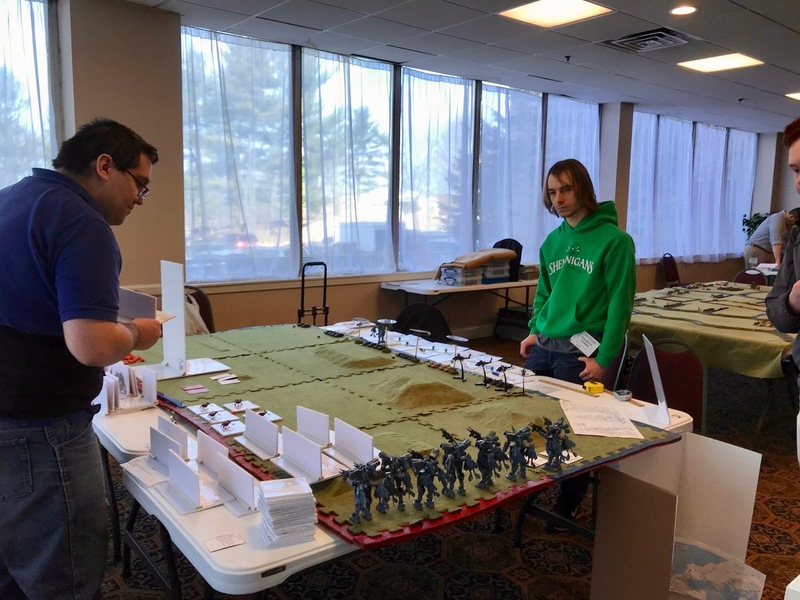 Now that we have some rules familiarity again, I hope to have the game on the table again sooner than five years from now, and with some additional troop choices. 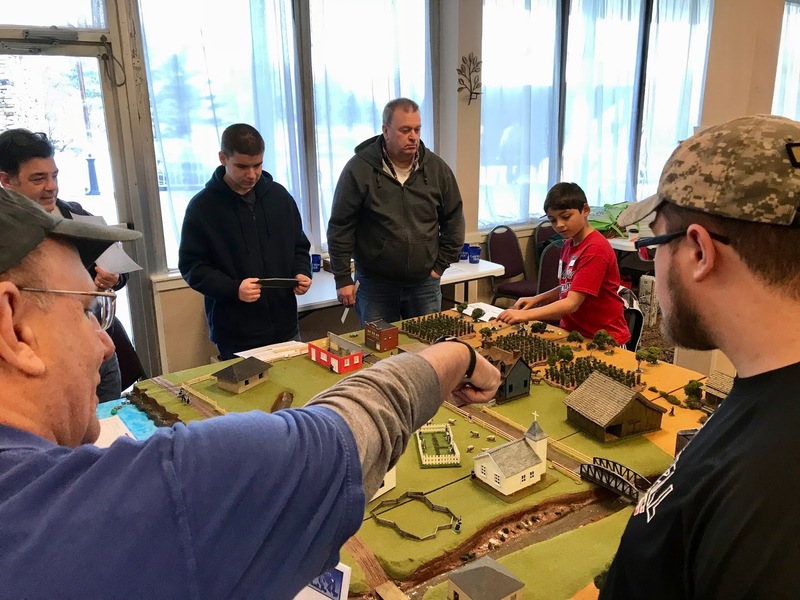 Once familiar with the mechanics, I think we’d get through a game in an hour and a half, so playing two sessions should be a reasonable expectation for an afternoon’s gaming. 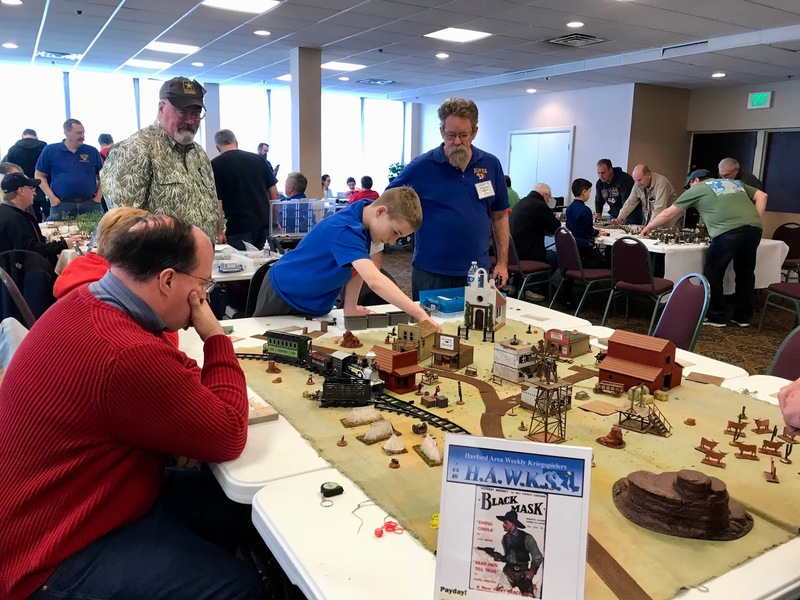 Chris Palmer This past weekend at Cold Wars, Buck Surdu and I ran a GASLIGHT game using our collections of warrior frog miniatures, mainly from Eureka’s “Pond Wars” range. Back when these were first released a number of years ago, Buck and I each acquired sizable collections; he painting his as standard North American frogs, and me painting mine as various South American Poison Dart Frogs. Thus was born he great Frog Civil War between the Northern Frogs vs the Southern Frogs. The South American “Flying Column” advances on the North American right, screened by a series of steep hills. 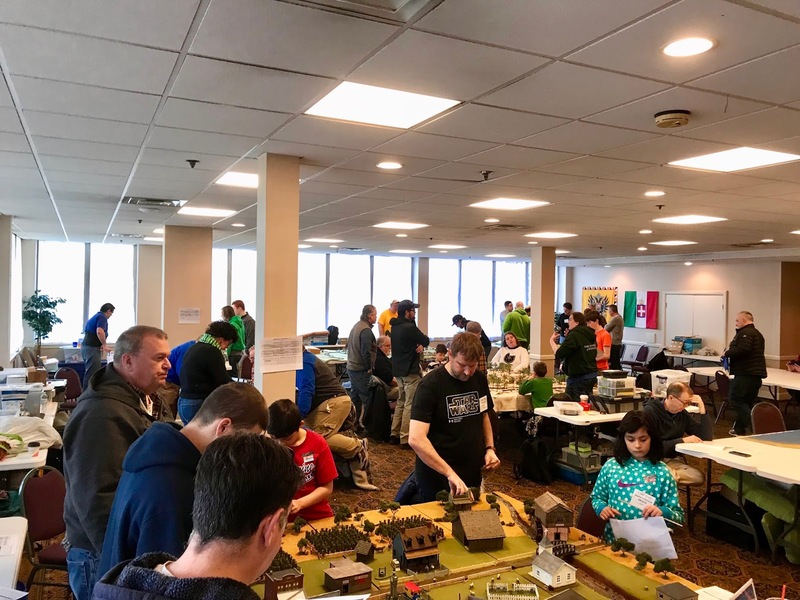 Over the years we have run a handful of games at conventions, and since it had been a while, we decided to dust them off and get them on the table for Cold Wars this year. The scenario we decided on was one from the GASLIGHT Compendium rulebook, and featured one side trying to intercept and cut the line of retreat of the other side. 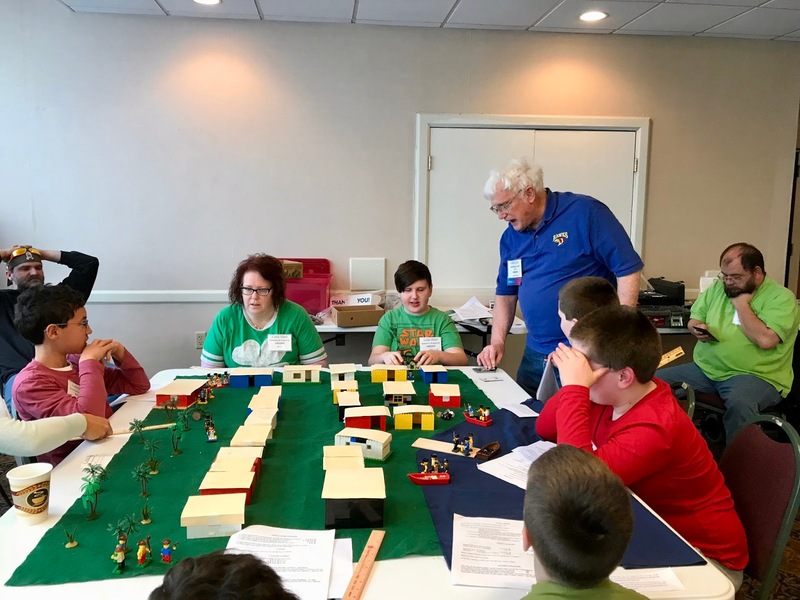 We called the game, “A Lily Pad Too Far”, and decided that instead of retreating, Buck’s forces would be advancing through Southern Frog territory, and my army was trying to cut off their line of advance. In order to achieve this, my side had to have a unit on the far side of the road the Northern Frogs were advancing down by games end. A view of the NFA players and their forces as the NFA units try to shake out into a line. 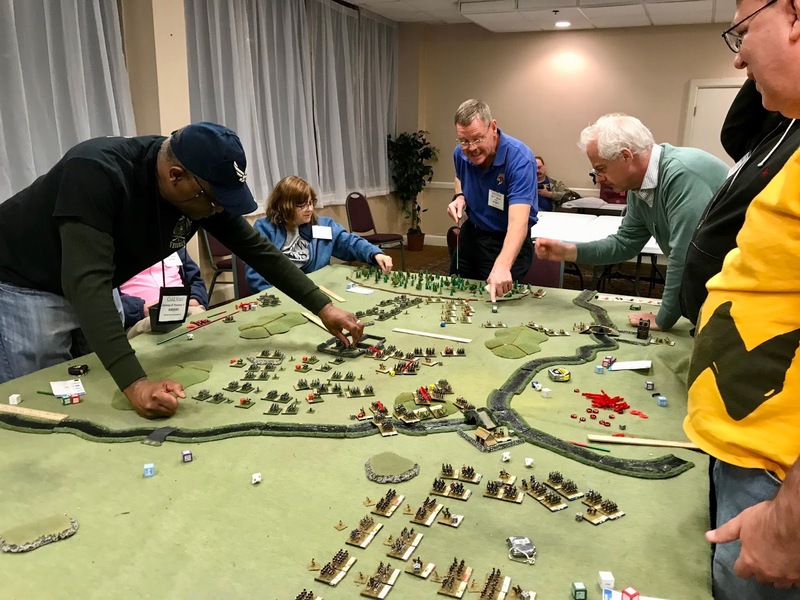 While the Northern Frog Army (NFA) starts in line of advance on a road running from the long side of the table to one of the short sides; the Southern Frog Army (SFA) begins the game split into the main body, which starts in one corner opposite the NFA, and a “Flying Column” consisting mainly of SFA cavalry, which starts in the other corner opposite the NFA. The SFA Dragonflies take on the NFA Light Cavalry. As the game started the NFA tried to extend their line and protect the entire length of road. They were hit on both flanks by the respective SFA forces. 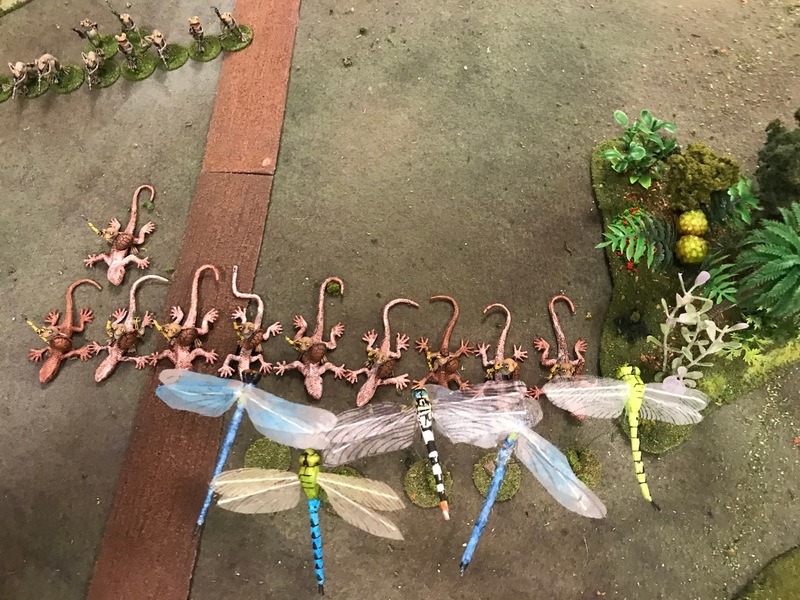 The NFA Light Cavalry did a good job on the NFA right, but eventually a unit of SFA Dragonflies was able to work around them and cross the road. On the NFA left, the full might of the majority of the SFA force slowly began to erode that flank. 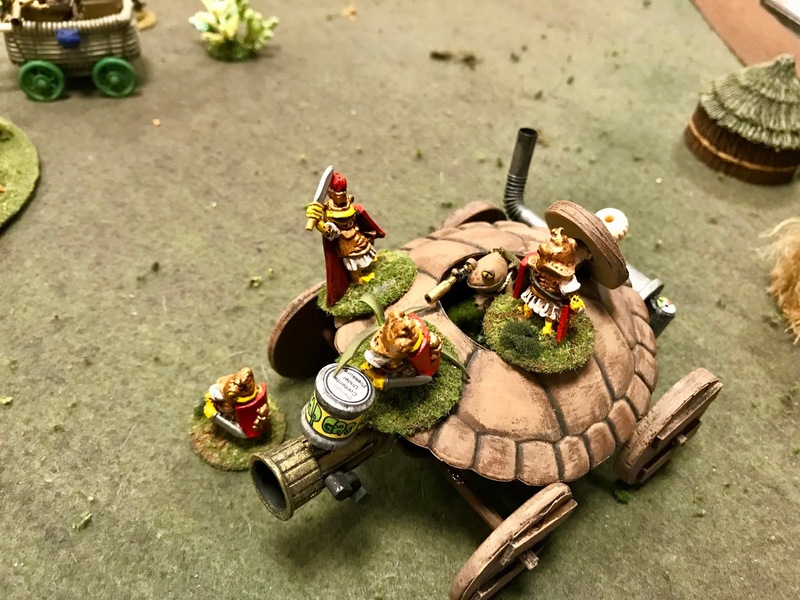 The SFA Light Cavalry charges into a unit of NFA Hammer Troops. 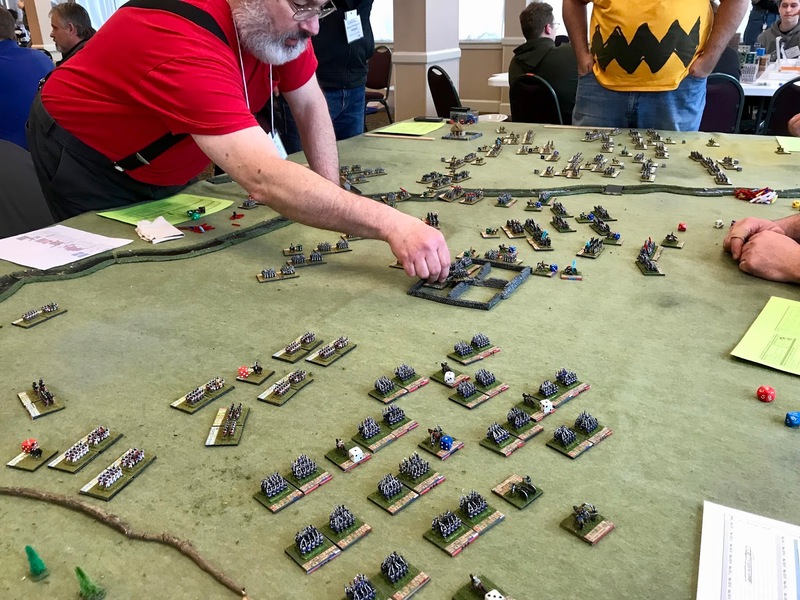 In the end, the NFA left flank had all but collapsed, and the NFA were unable to shoot the SFA dragonflies out of the air. So, the SFA was declared the victors. 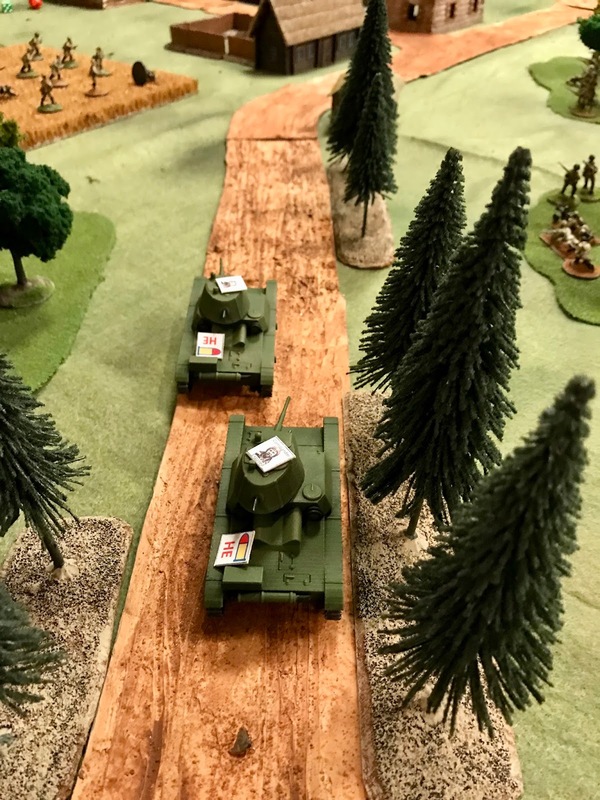 The NFA Heavy Cavalry moves up as it tries to halt the rapidly advancing SFA right. 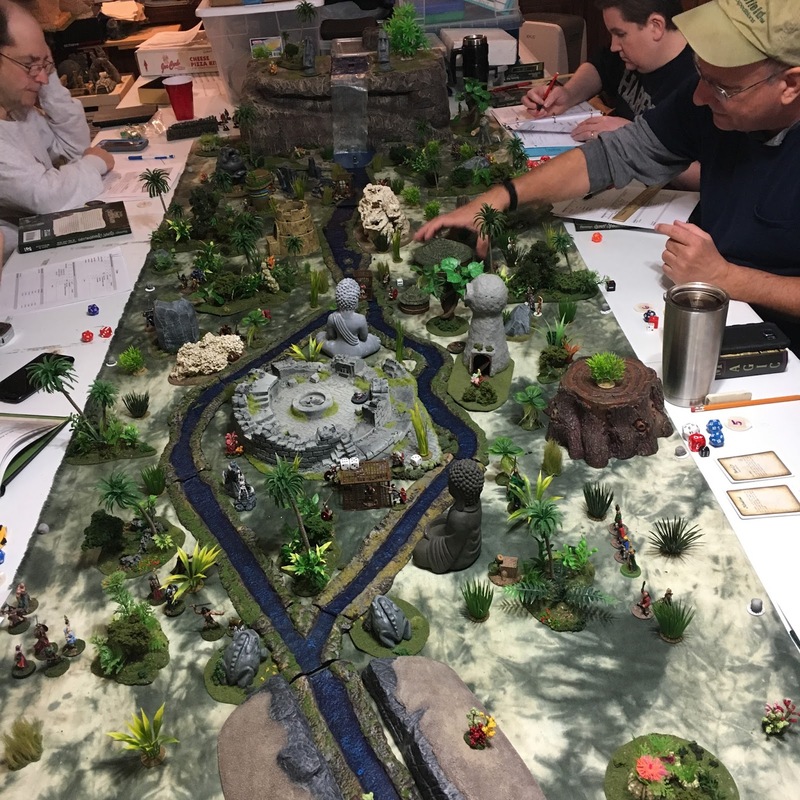 The game was a ton of fun both for the players and us as the GMs, and it was great to get our Frog collections out on the table again. I look forward to the next time! 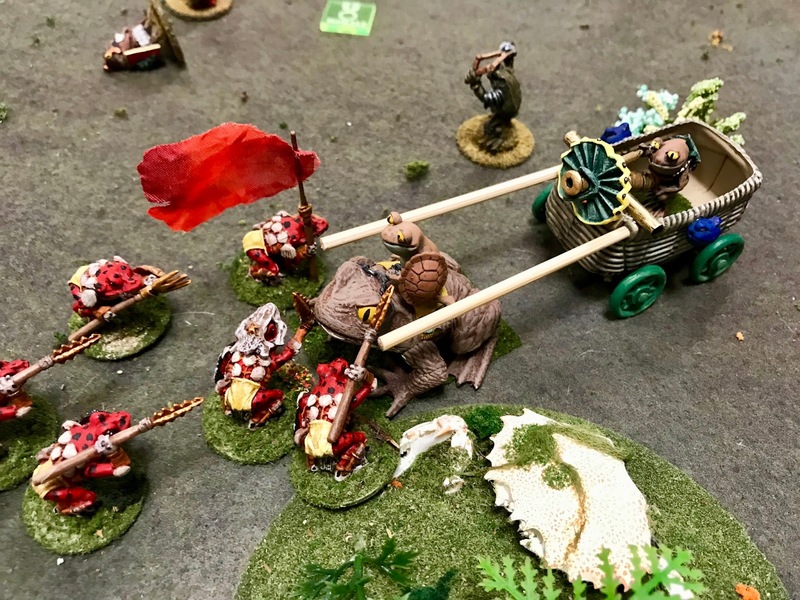 A unit of SFA “Frogzerkers” overtakes and eliminates the NFA War-Cart. A unit of the SFA Guard close assaults a NFA Swamp-Gas Tank. 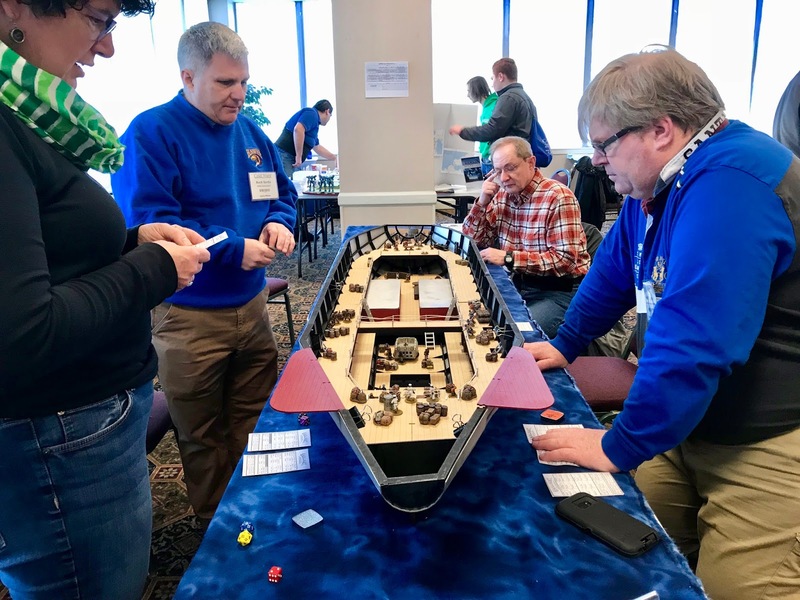 Chris Palmer and I ran a GASLIGHT game on my 7-foot long zeppelin. The scenario involved Professor Serafini Nannini transporting his rocket sled in Duke Morrison’s zeppelin. 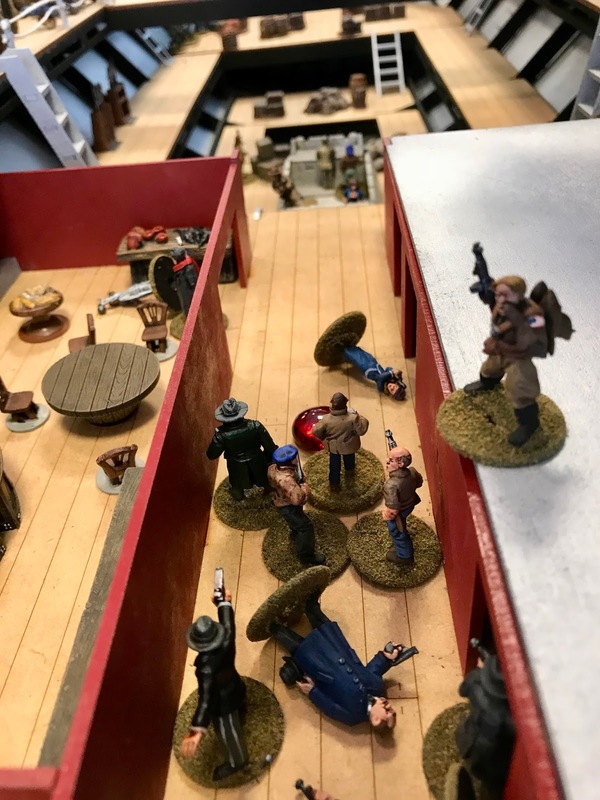 (Duke Morrison is the hero of my pulp games using GASLIGHT.) Nannini and his daughter Gianna had hidden six components of one of his fabulous inventions around the zeppelin for security reasons. As Nazi rocket troopers and hired gangsters attack the zeppelin to seize Nannini, the rocket sled, and the six components, Duke Morrison (and his soldiers), “Boats” Morgan (and his sailors), “Wrench” Webb (and his soldiers), the Nanninis and their lab workers, MacDuff (and his police), and “Crash” Corrigan (and his rocket troops) work to gather together the components and move them to the rocket sled. The game was to end at exactly 1130 (wall clock time). If the good guys had gathered the components and had them in the rocket sled at 1130, the sled would launch, and the good guys would win. The sled could not be launched until 1130. Oh, and only five people could drive the sled, so one of them needed to last that long. The five people who could pilot the sled were Duke, Boats, Wrench, Prof. Nannini, and Gianna Nannini. 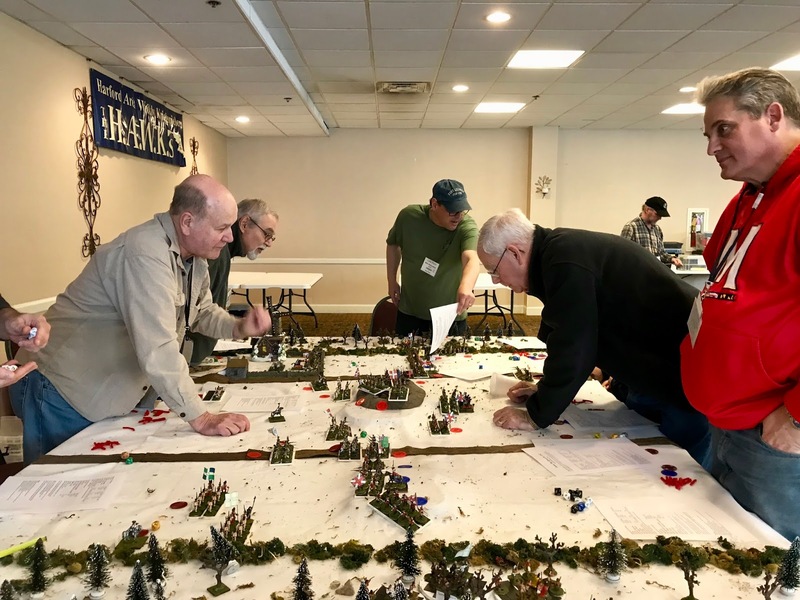 With eight players worth of figures, the game came down to three figures at 1128. There were two gangster minions left and Boats Morgan, who was in the rocket sled. Everyone else had gotten killed during the three hours of zany shoot-em-up. The two gangster minions shot at Boats with just two minutes left to play. One of them scored a hit, and Boats failed his Save. The bad guys had all the components (five of which the good guys had conveniently carried to the rocket sled) and the sled itself. And they also possessed Duke’s zeppelin, as none of Duke’s men survived. Below are some pictures of the action at various points of the game. I think the players all had a really good time. The fact that the game came down to the last three figures two minutes prior to the game’s end contributed. All the players got into the light-hearted spirit of GASLIGHT. 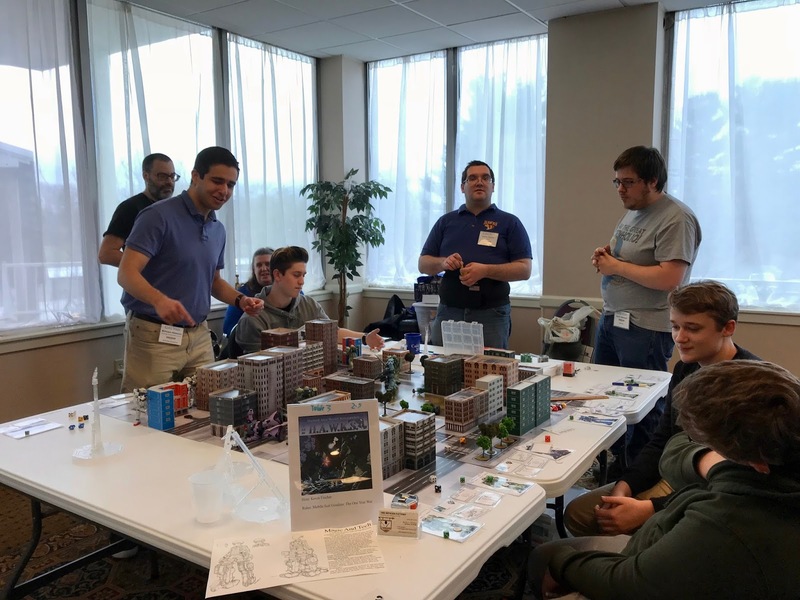 At Cold Wars 2018 in Lancaster, PA, last weekend, Chris Palmer and I ran a GASLIGHT game involving giant anthropomorphic frogs. We haven’t had the frogs on the table in a couple of years. The game was pretty fun. The scenario is from The GASLIGHT Compendium. The North American frogs are part of the advance guard for a frog column. The South American frogs are trying to cut off their line of march. 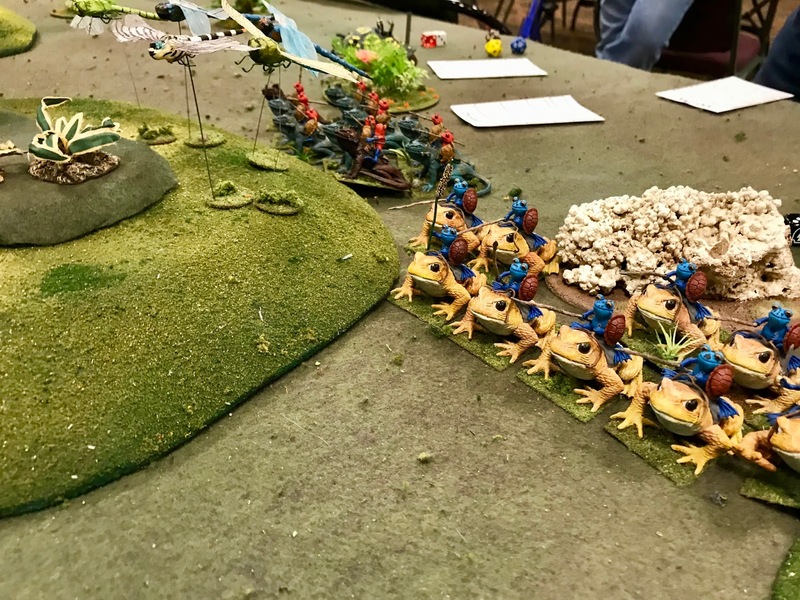 The North American frogs quickly deployed from their march formation to engage the South Americans. 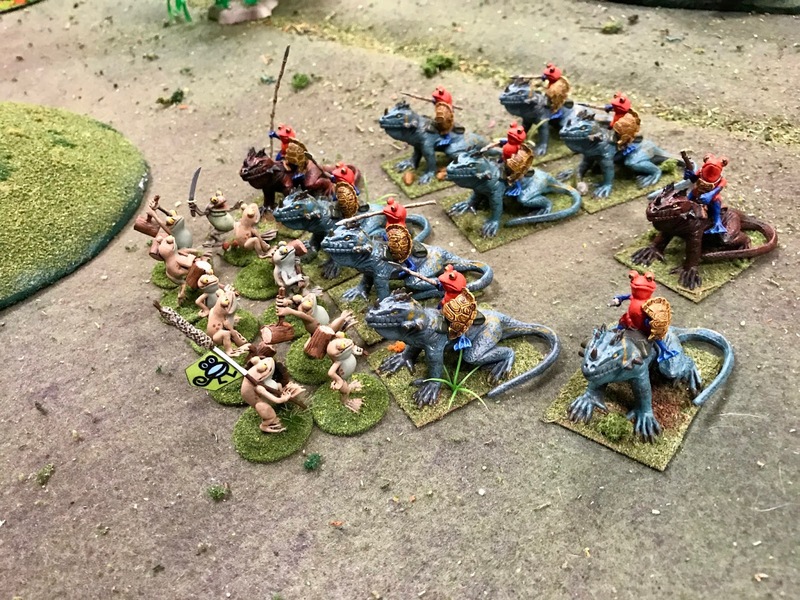 The South American frogs advanced on both flanks, enjoying success in both attacks. 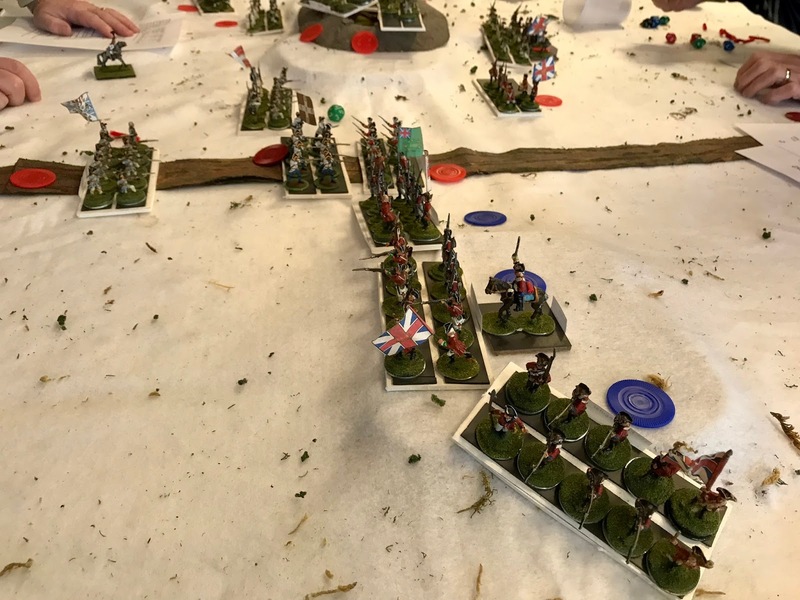 The North American right flank held on and began to advance, but the dragon flies moved to a blocking position and determined to hold their portion of the road. The South Americans were crushing the North American left flank, preparing to cut the road. They also had the dragon flies across the road. At that point, we called the game a South American victory.